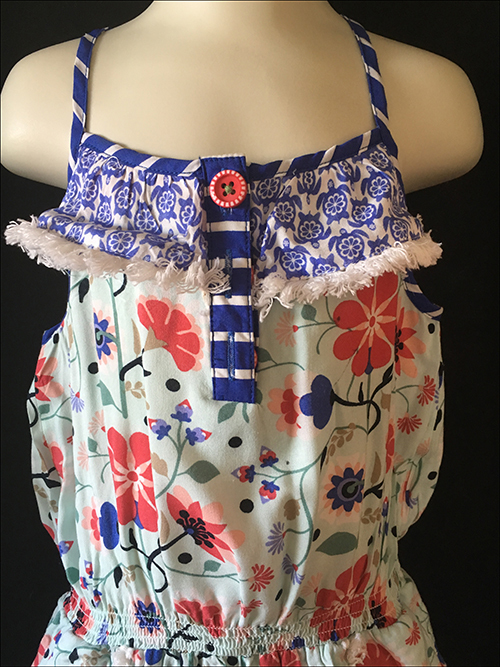 This beautiful Custom Boutique hand made Suspender Skirt is in a gorgeous blue and pink rose print cotton with an elasticised rear waistband, adjustable straps and wooden buttons. Size 6, it's about 35cm long and in excellent, gently used condition. 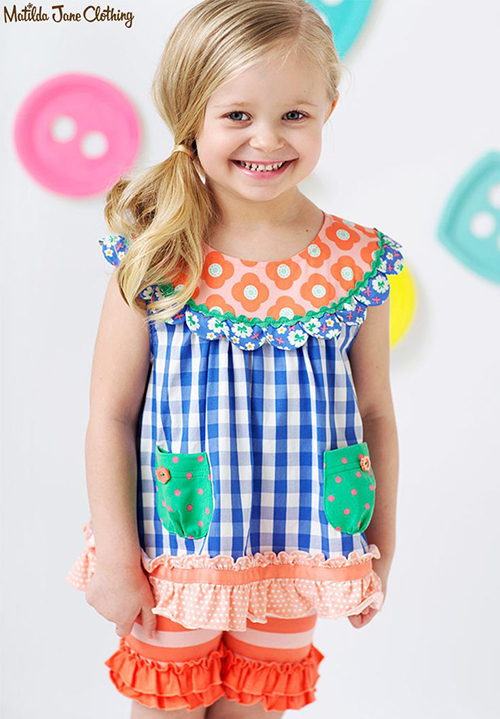 This is the lovely Wheelbarrow Race tunic top from Matilda Jane's The Adventure Begins collection, in a cobalt blue cotton with a sweet yellow polkadot ruffle trim and fun orange rope detail to the back. 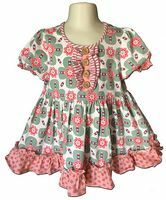 Size 6, it's about 66cm around the chest under the arms and 49cm long shoulder to hem, and is new with tags. 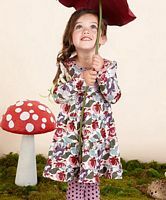 This is the beautiful Riding Bikes Pearl Dress from Matilda Jane's The Adventure Begins collection, in a pale lilac 95% cotton 5% Spandex jersey with a gorgeous rose print throughout and ruffle shoulders. 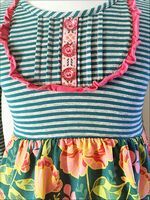 Size 6, it's about 66cm around the chest under the arms and 64cm long shoulder to hem, and is in excellent, gently used condition. 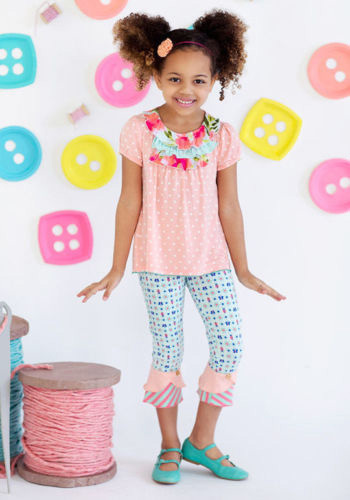 This was *the* set to get from the Matilda Jane Hammond Bay collection and sold out within a couple of hours. 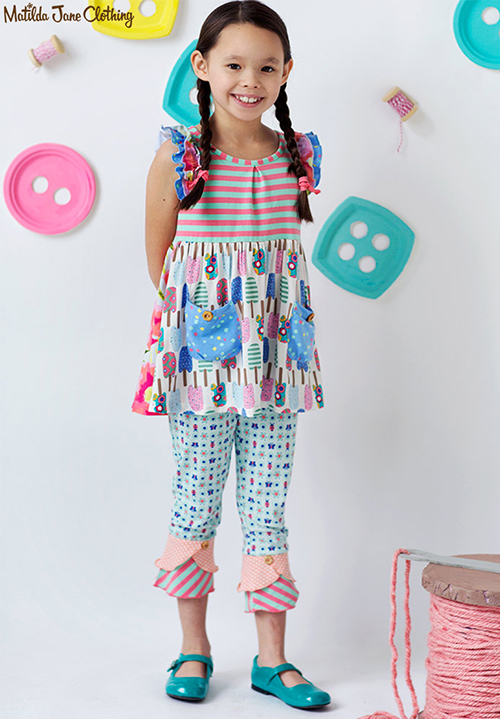 The Wendy Tiered dress uses a variety of fabrics so can be used with leggings from other collections including the candy pink ones from Gypsy Blue and the hot pink polkadot ones from Sparkletown, but they look especially fun with the Happiness leggings here with the tiny birds (owls?). 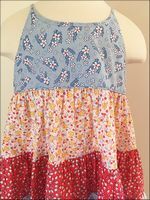 Size 6, it's about 64cm around the chest, and 60cm long shoulder to hem - intended to be worn shortish and with the leggings. 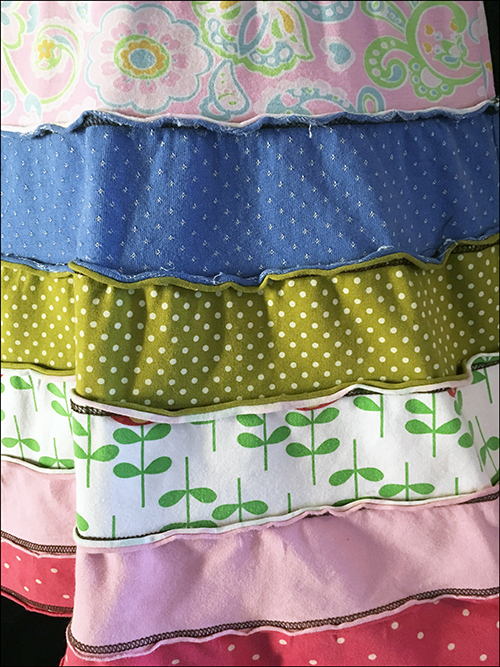 All the hems are intentionally raw cut and designed to fray and curl a little. 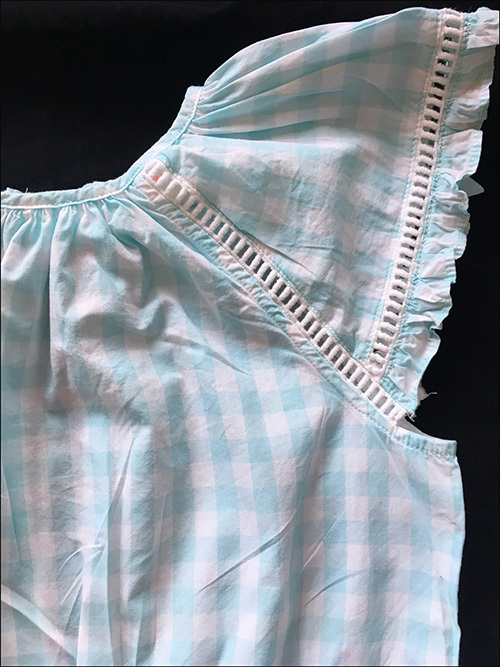 It's in great used condition with just mild wash fade and a tiny 2cm of contrast (non-functional) stitching having unraveled on the rear bottom hemline. 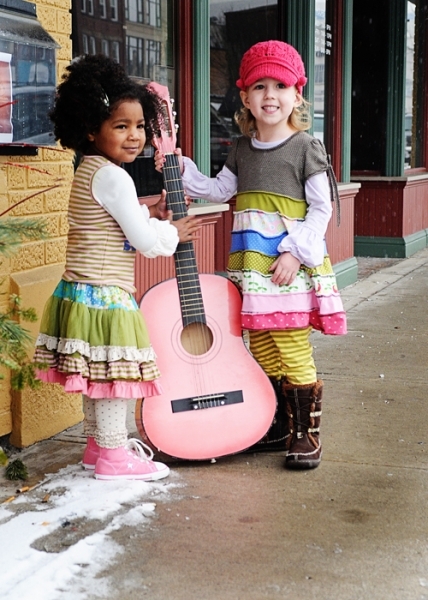 This dress works equally well as a winter dress when layered as shown. 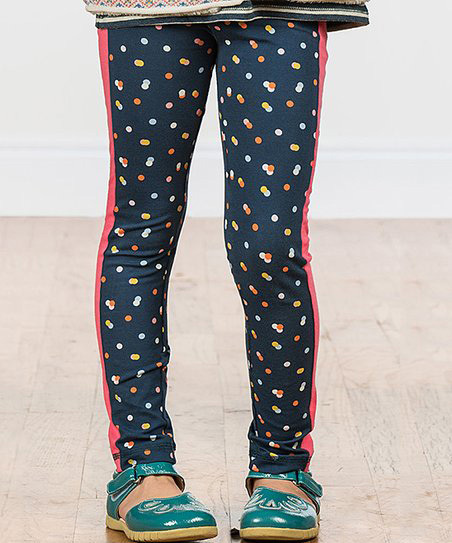 The Happiness Leggings are in 92% Cotton, 8% Spandex and measure about 53cm long waistband to ankle and 39cm on the leg inseam. 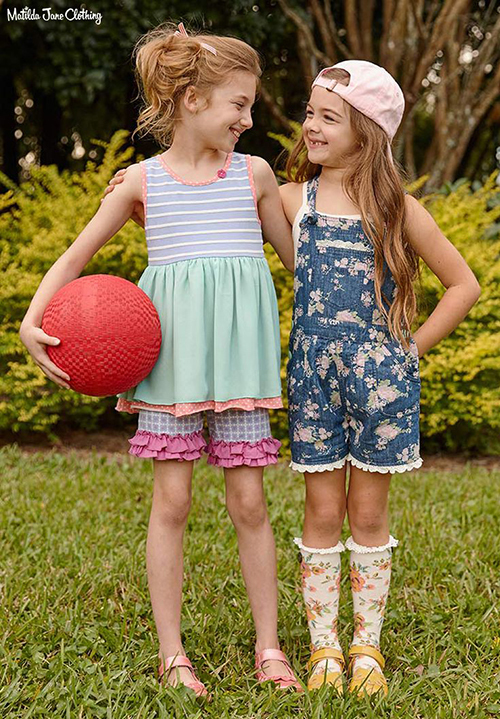 Love the ruffled hems! These have marks on each front leg as shown which may shift with further soaks but otherwise have only very light wash fade and minimal wear. 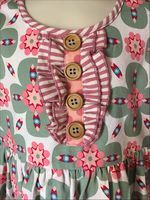 All the Matilda Jane Molly skirts are a favourite with me but this was was particularly special as it's from one of my favourite collections - Gypsy Blue. 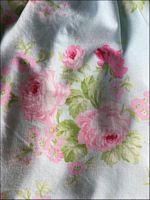 It features a mix of gorgeous fabrics including a woodblock rose and a pink damask, and is in a 60% Cotton, 38% Nylon and 2% Spandex blend. 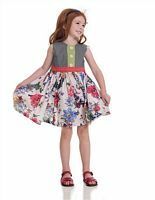 The Molly is my absolute favourite Matilda Jane skirt design as it just looks SO fantastic on - full and flouncy and great for twirling. 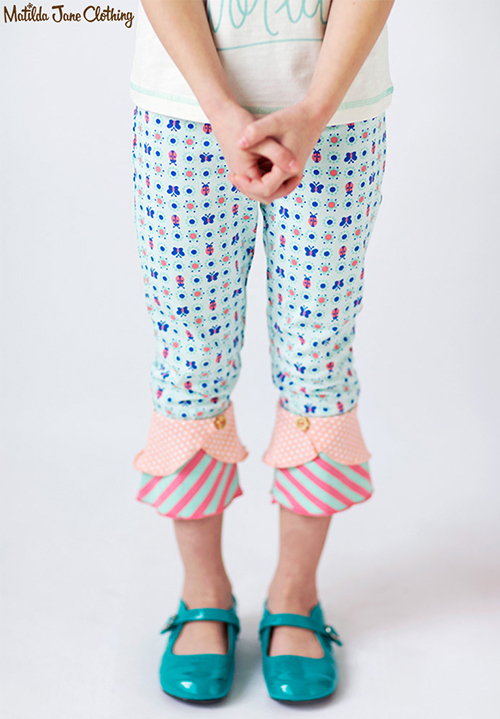 The elasticised waistband makes it both comfy to wear and very versatile size-wise. 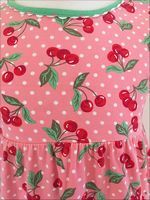 This one is a Size 6 and measures about 33cm long from waistband to hem - could work for a Size 5, 6 or 7 easily. 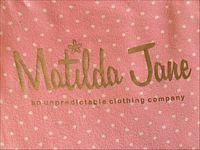 This has only been gently worn and is in excellent used condition - the quality of the designer fabrics shines through in the fact that there is barely any visible wash fade or wear. Use it year-round as it works for all season, and is simply gorgeous on - buyer will LOVE it! 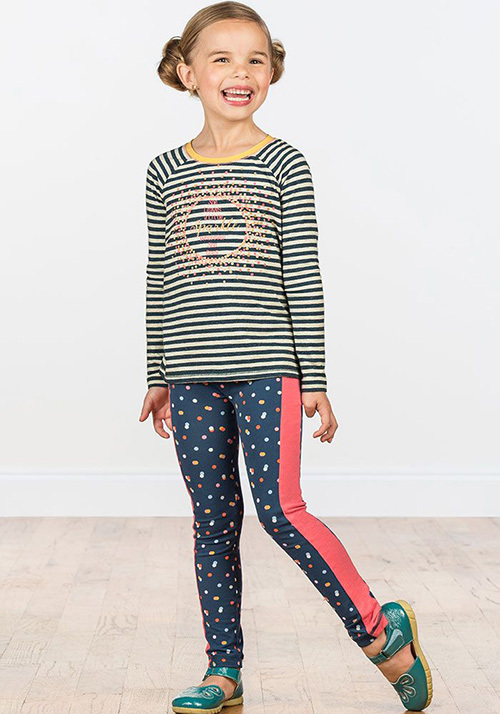 These are the gorgeous Lounge Around leggings from Matilda Jane's Make Believe collection, in a confetti print teal 95% Cotton 5% spandex blend with mango striped outer legs. 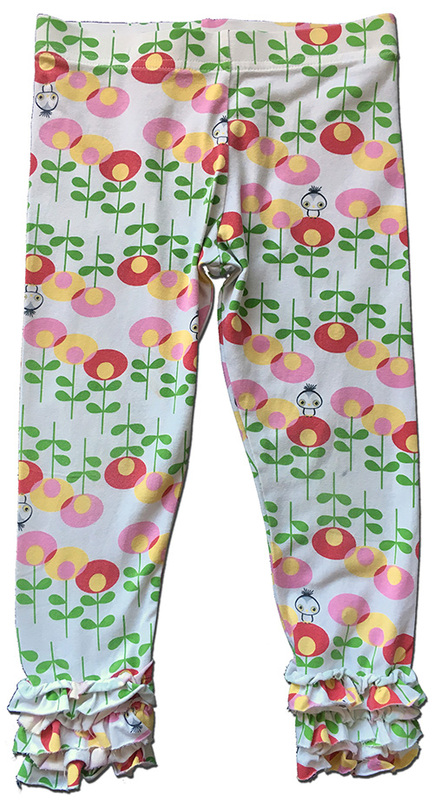 Size 6, they're about 65cm long waistband to ankle and 49cm on the leg inseam and are brand new with tags. 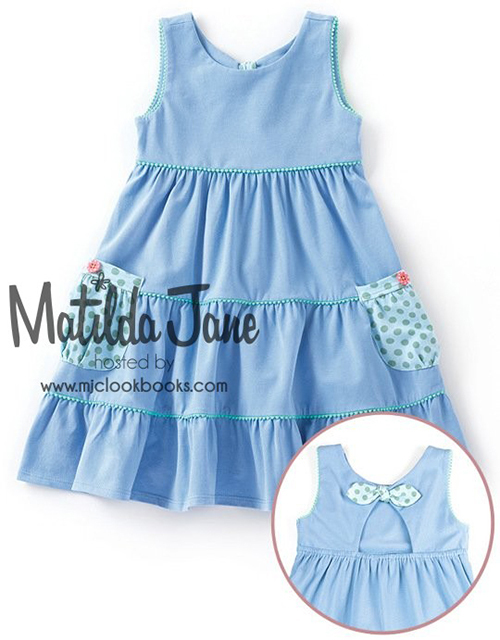 This is the beautiful Mission Bay dress from Matilda Jane's Happy and Free collection, in a lovely blue (very hard to capture, closer to the stock photos) 95% cotton 5% Spandex jersey with cute polkadot pockets and rear bow detail and tiny pom-pom accents to the tiers. 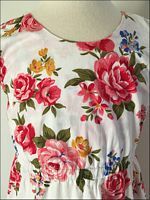 Size 6, it's about 58cm around the chest under the arms and 63cm long shoulder to hem, and is in excellent, gently used condition overall with the only flaw being a small hole to the bodice as shown - you could cover this with a brooch or sew a patch or flower over it. Priced accordingly low. 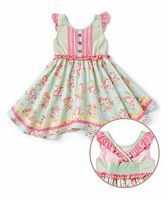 This is the beautiful Heat Wave dress from Matilda Jane's Happy and Free collection, in a gorgeous pale green cotton with an exquisite floral print, crossover flutter sleeves, a shirred, elasticised back and watermelon pink grosgrain ribbon trims to the bodice. 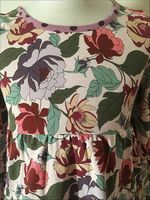 Size 6, it's about 62cm around the chest under the arms unstretched and 70cm long shoulder to hem, and is in excellent, gently used condition. 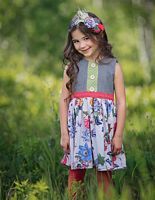 On offer is an adorable set from Matilda Jane's Happy and Free collection - the Picnic Pie tunic top and Licorice Laces shorties. 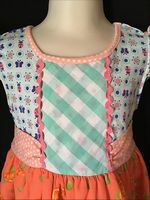 The top is in a blue and white gingham check with a sweet orange floral wide neckline and green polkadot pockets, and is a Size 6, measuring about 76cm around the chest under the arms and 44cm long shoulder to hem, and is in excellent, gently used condition. 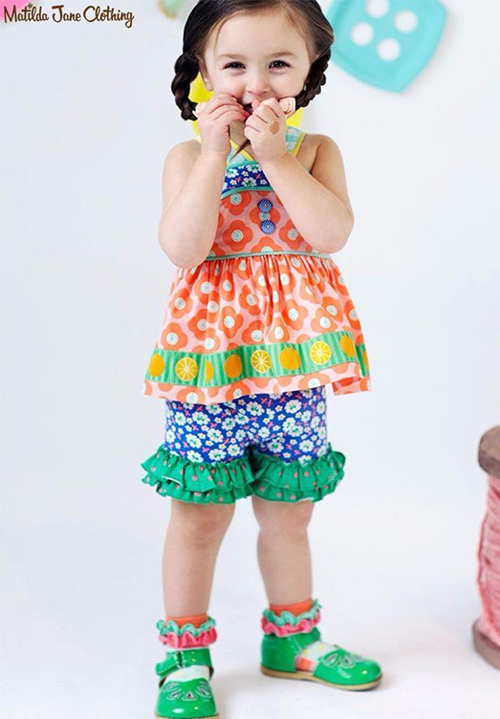 The shorties are in am orange striped 95% Cotton 5% Spandex, with cute double ruffle trims on the legs. Also Size 6, they're about 26cm long on the outer legs and 11cm long on the leg inseam, and also in excellent, gently used condition. 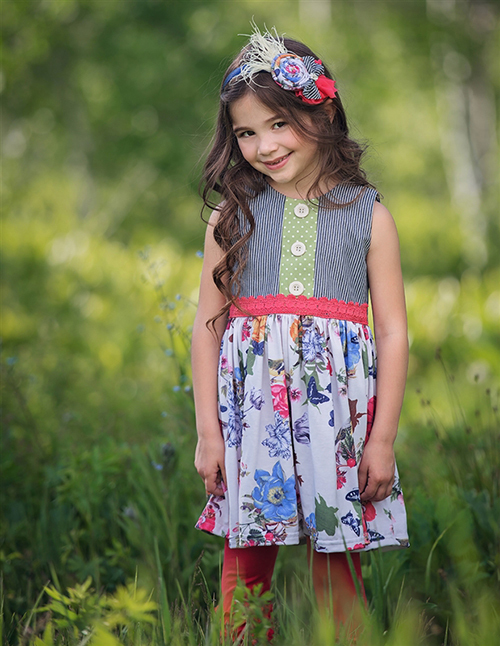 This is the gorgeous Wildflowers Maggie dress from Persnickety, featuring a sleeveless grey pinstripe bodice with a jersey skirt covered in wildflowers, birds and butterflies. 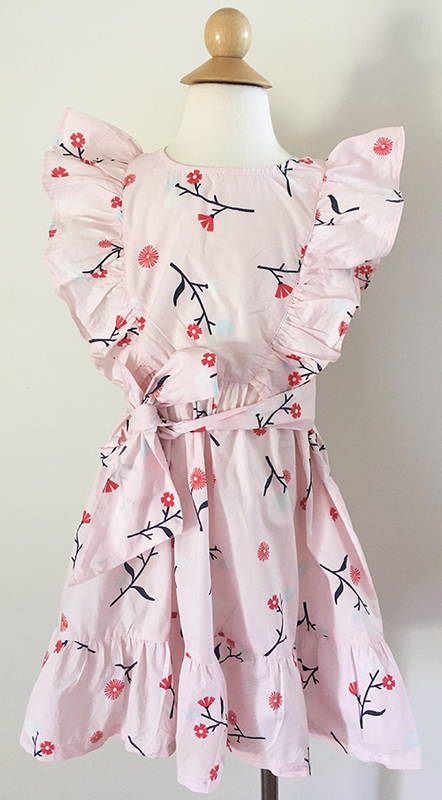 Size 6, it's about 62cm around the chest under the arms unstretched and 62cm long shoulder to hem, and is brand new with tags, having retailed at over $AUD115. 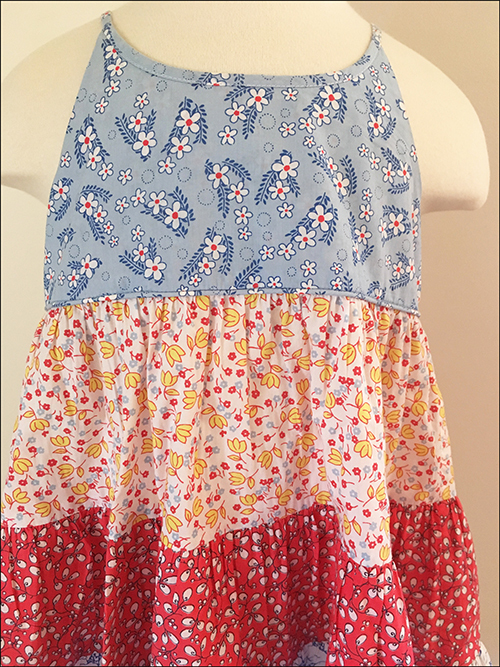 This is the gorgeous Wonderstruck Jordyn dress from Persnickety, in a comfortable 95% Polyester 5% Spandex jersey with a pretty blue china-style print throughout. 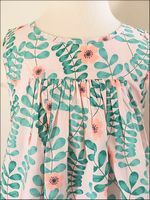 Size 6, it's about 64cm around the chest under the arms unstretched and 66cm long shoulder to hem, and in good sturdy condition but priced low to reflect the fact that it has a little pilling as well as a small mark along the neckline which may shift with a soak. This originally retailed at over $AUD80. 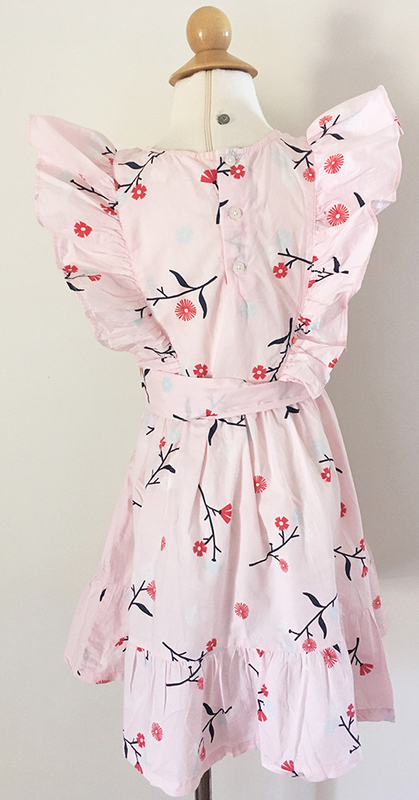 This pretty dress from Country Road is in a light and floaty pink 100% cotton with a lovely floral print, rear buttons and flutter sleeves. 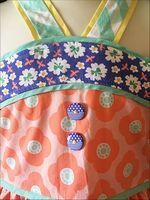 It fastens with a concealed side zip and has a detachable waist sash - please note that the left hand side sash loops are broken. Size 6, it's about 68cm around the chest under the arms and 65cm long from shoulder to hem, and is in excellent, gently used condition. 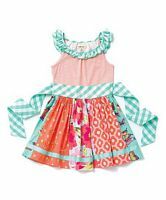 This is a great set of two designer dresses for your Size 6 little girl which are priced incredibly low to reflect the fact that they both have a few flaws. 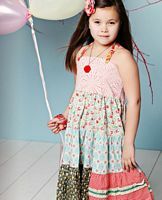 First is a beautiful piece from Seed Heritage which was called their Cherry Print Yardage dress. 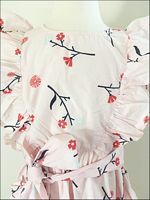 It's in a light and floaty cotton voile with pink candy stripes, a lovely cherry print, rear buttons and flutter sleeves. 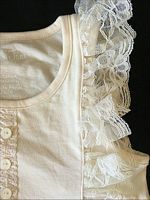 It measures about 64cm around the chest under the arms and 63cm long shoulder to hem, and overall could almost pass for new without tags with the exception of a faint mark on the front which lightened with a soak but didn't completely shift. 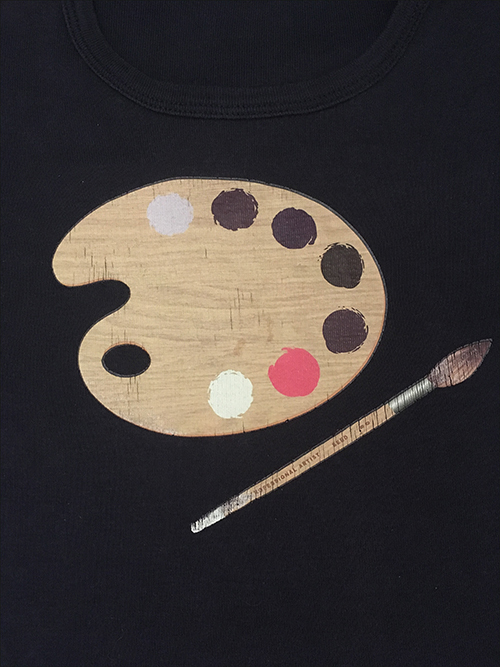 Not massively noticeable when worn due to the busy print. 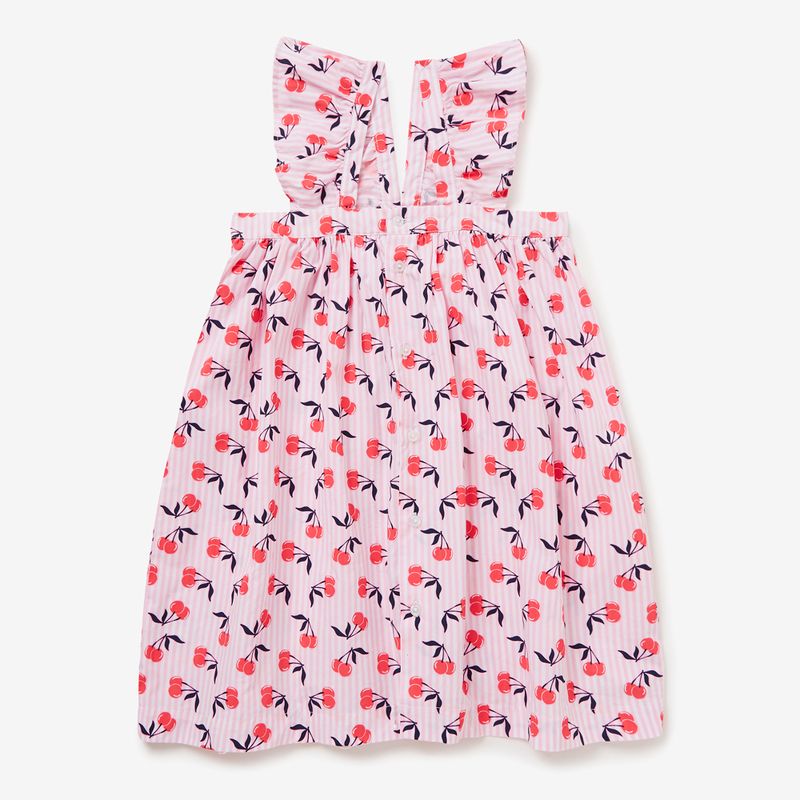 The second dress is from Country Road, in a fully lined 100% cotton with a gorgeous Pink (Major Mitchell's) cockatoo print throughout. 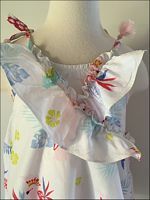 It features an elasticised back, shoestring tie shoulder straps with tassle ends, and a ruffle-accent bodice. This is about 62cm around the chest under the arms unstretched and 44cm long from underarm to hem, with the overall length adjustable. This is in a good, sturdy condition but has several faint yellowy stains throughout which haven't soaked out - they extend to the straps and I suspect they're probably from sunscreen. Again, not massively noticeable but they're there so this is better used as playwear. 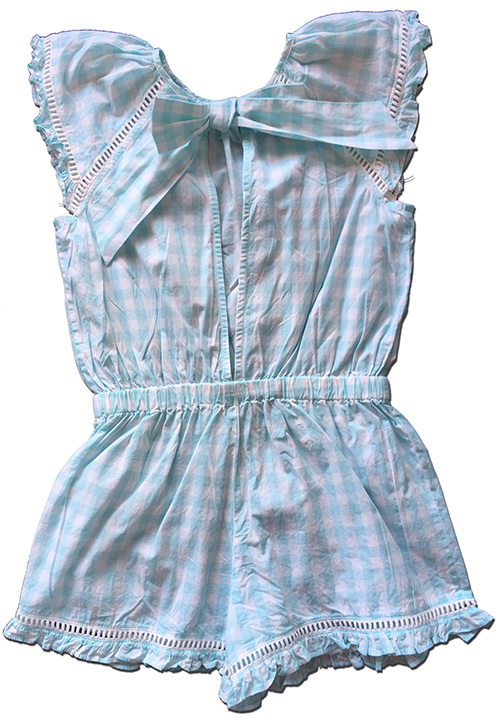 This sweet little playsuit from Country Road is in a mint and white gingham cotton and features a comfy elasticised waistband, flutter sleeves, and a fun snap-button closure with large bow detail. 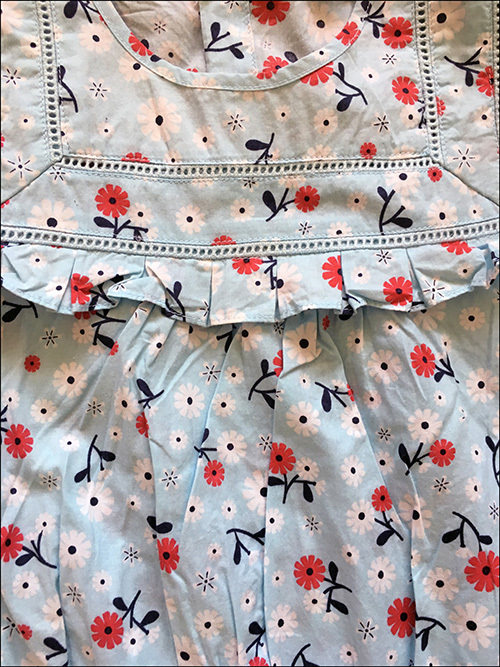 Size 6, it measures about 82 around the chest under the arms, 61cm long shoulder to hem and 6cm on the leg inseam, and is in great used condition with only mild wash fade and wear. 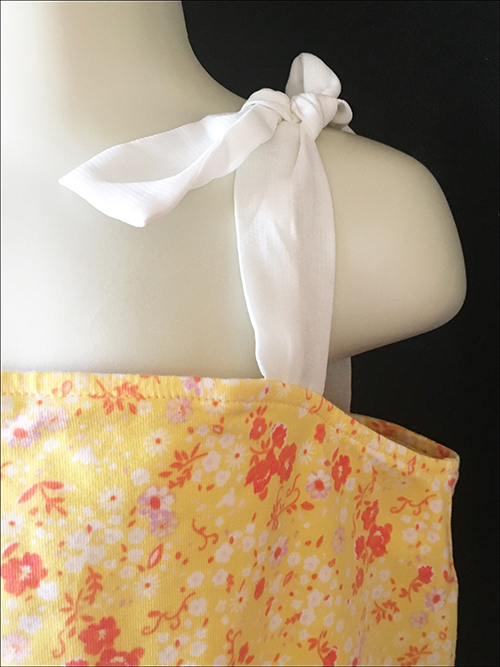 As a bonus, I'm also including two elasticised bow hair accessories which match the romper so nicely! They have a few light marks but still have a tonne of life left in them. 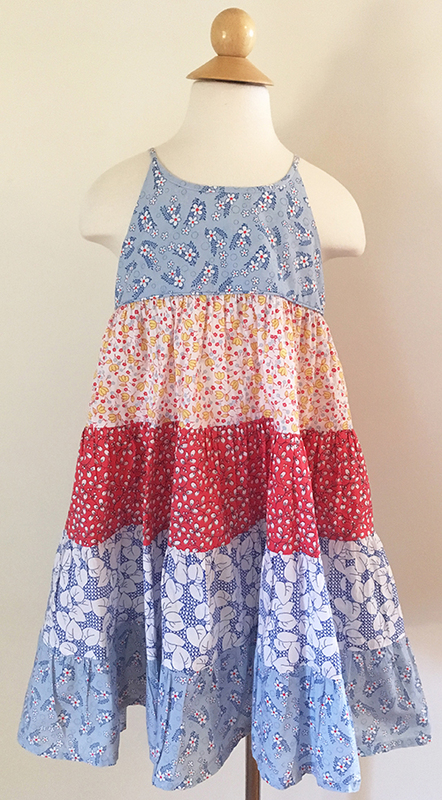 This beautiful tiered cotton sun dress from Country Road is sewn in a mix of ditsy floral prints and features shoestring shoulder straps with tassled ends as well as a gloriously full and flowing skirt. Size 6, it's about 64cm around the chest under the arms and 71cm long shoulder to hem, and is in excellent, gently used condition. 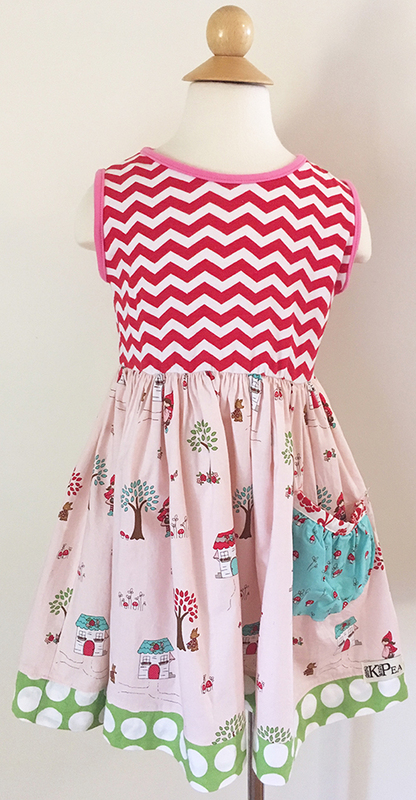 This adorable dress from American label K Pea features a sleeveless, red chevron print jersey bodice with a gorgeous Little Red Riding Hood print skirt and green polkafot trim. 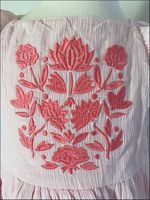 Size 6, it measures about 64cm around the chest under the arms unstretched and 63cm long shoulder to hem. 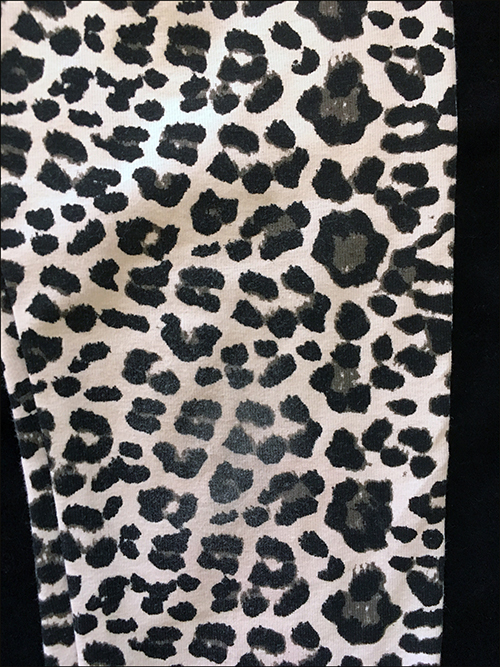 Every girl needs some leopard print in her wardrobe and this is a great example - a sweet pair of leggings from Witchery Kids in a stretch 95% Cotton 5% Elastane with an elasticised waistband. Size 6, they're about 59cm long waistband to hem and 43cm on the leg inseam, and overall are in superb, barely used condition but are priced so cheaply as they have smudges to both knees as shown. Tonnes of life left in these yet though. 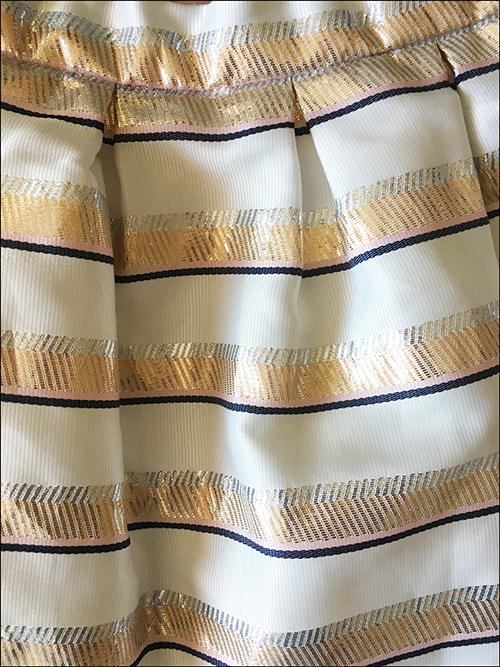 This gorgeous skirt from Seed Heritage is in a fully lined cream polyester with metallic gold and silver stripes and a built-in tulle net petticoat. 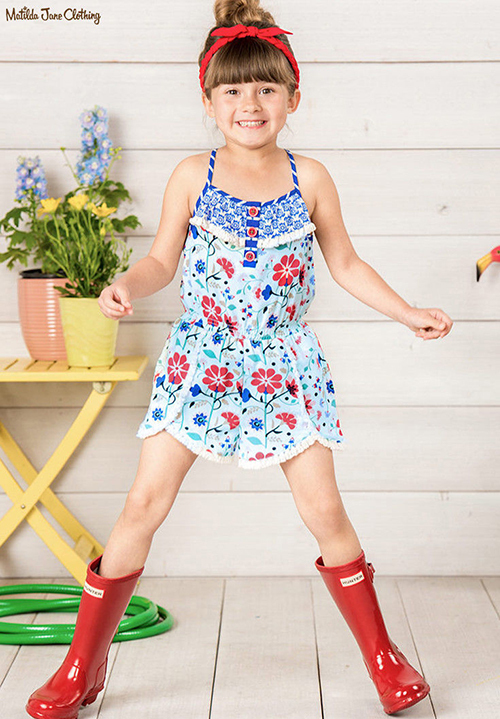 It fastens with a concealed side zip and has inner-adjustable button tabs for a perfect fit. Size 6, it's about 28cm long and is in excellent, gently used condition. 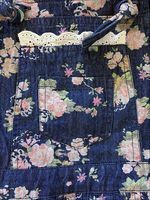 This beautiful skirt from Seed Heritage is made from a fully lined 100% cotton in chambray blue and white stripes with an intricately embroidered floral pattern and a comfy, wide elasticised waistband. 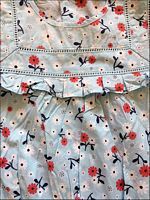 Size 6, it's about 26cm long waistband to hem and is brand new with tags, showing the RRP of $49.95. 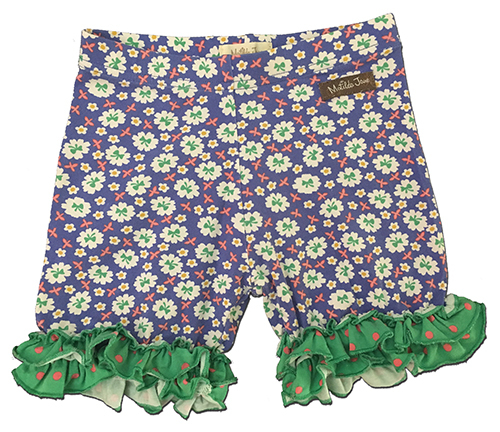 TThese lovely shorts from Seed Heritage are in a light and cool 100% Cotton Voile with an elasticised waistband and ruffle trims. 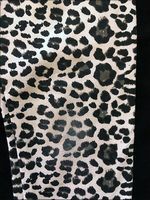 Size 6, they're about 25cm long from waistband to hem and 7cm on the leg inseam, and in excellent, gently used condition. 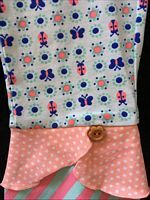 These are the gorgeous Betty Jo shorts from Rock Your Baby, in a Vintage Rose Print Candy Pink 95% Cotton 5% Spandex, with a zip fly, standard 5 pocket jeans styling and leg cuffs. 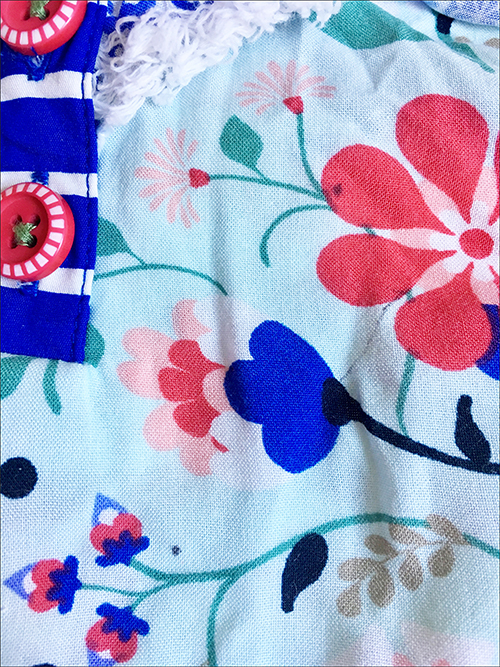 The size tag has been cut out but they're a Size 6, measuring maximum 58cm on the adjustable-button-tab waistband, 26cm long waistband to hem and 9cm long on the leg inseam. These are in good used condition with just a small scuff to the rear logo but are missing the original rope-tie waist sash as shown in the stock photos. This gorgeous little jacket from Rock Your Kid is in a cobalt blue rose print 95% Cotton 5% Spandex blend jersey, and fastens with rose pink buttons. 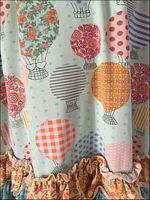 Size 6, it measures, unstretched, about 72cm around the chest under the arms and 47cm from shoulder to hem, and is brand new with tags attached. 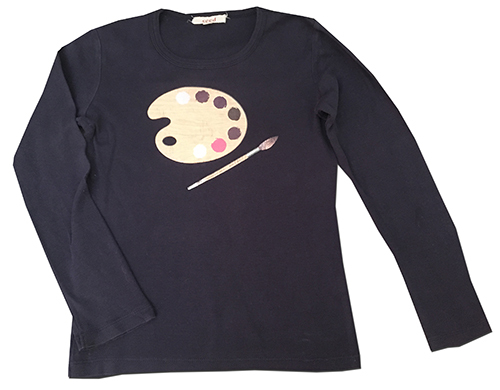 This gorgeous dress from Seed Heritage is in a cosy navy 100% Cotton (like windcheater fabric, non-fleece lined), and features long sleeves and a fun sequined cherry print throughout. Size 6, it's about 72cm around the chest under the arms unstretched and 62cm long from shoulder to hem, and in excellent, gently used condition with minimal wash fade. 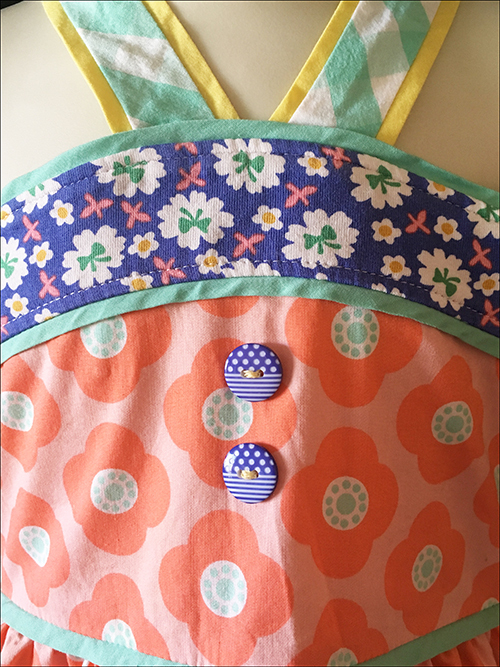 This beautiful hand crafted dress is from Ellie's Handmade, in a yellow vintage floral and bunny print and featuring short sleeves, rear buttons and the sweetest Peter Pan collar. Size 6, which according to the Ellie's Handmade size chart is to fit chest size 24.5" (62cm), it's about 60cm around the chest under the arms and 64cm long from shoulder to hem, and in exceptional, could-pass-for-new condition with the exception of two tiny dots on the bodice which blend in well with the busy print. 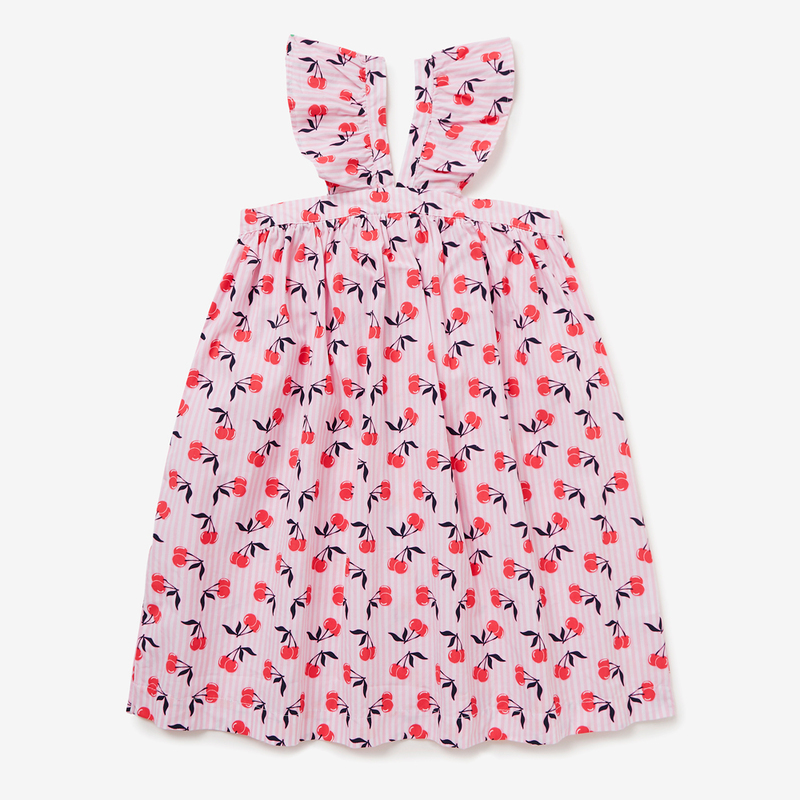 This beautiful hand crafted dress is from Ellie's Handmade, in a pink vintage floral and bunny print and featuring short sleeves, rear buttons and the sweetest Peter Pan collar. Size 6, which according to the Ellie's Handmade size chart is to fit chest size 24.5" (62cm), it's about 62cm around the chest under the arms and 64cm long from shoulder to hem, and in exceptional, could-pass-for-new condition with the exception of a faint yellow tinge to the edge of the left side of the collar which may shift with a soak. 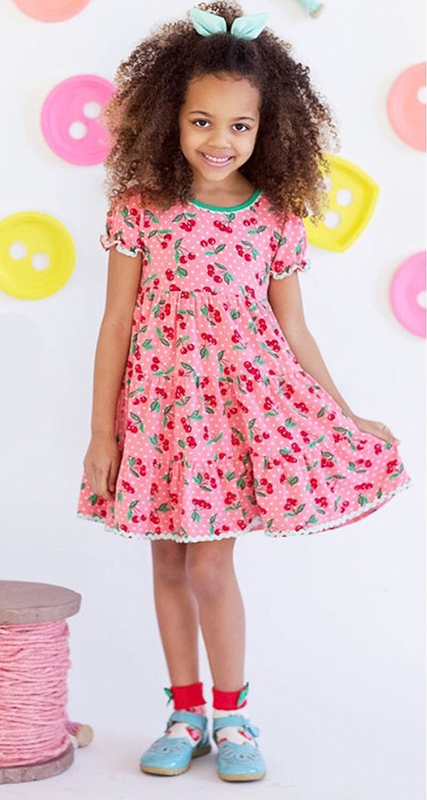 This beautiful hand crafted dress is from Ellie's Handmade, in a Mint vintage rose print cotton and featuring short sleeves, rear buttons and the sweetest Peter Pan collar. 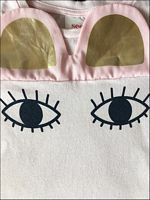 Size 6, which according to the Ellie's Handmade size chart is to fit chest size 24.5" (62cm), it's about 61cm around the chest under the arms and 64cm long from shoulder to hem, and in exceptional, could-pass-for-new condition. 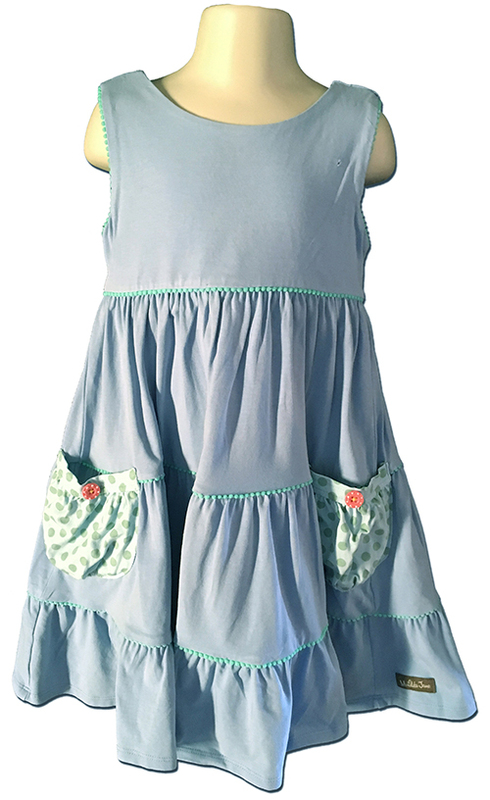 This beautiful hand crafted dress is from Ellie's Handmade, in a Sage green vintae floral print cotton, fully lined on the bodice, sleeveless and with front buttons. 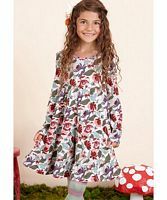 Size 6, which according to the Ellie's Handmade size chart is to fit chest size 24.5" (62cm), it's about 62cm around the chest under the arms and 61cm long from shoulder to hem, and in exceptional, could-pass-for-new condition. 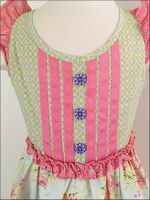 This beautiful hand crafted dress is from Ellie's Handmade, in a classic pink Seersucker cotton, fully lined on the bodice, sleeveless and with front buttons. 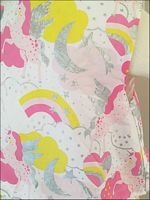 Size 6, which according to the Ellie's Handmade size chart is to fit chest size 24.5" (62cm), it's about 66cm around the chest under the arms and 62cm long from shoulder to hem, and in exceptional, could-pass-for-new condition. 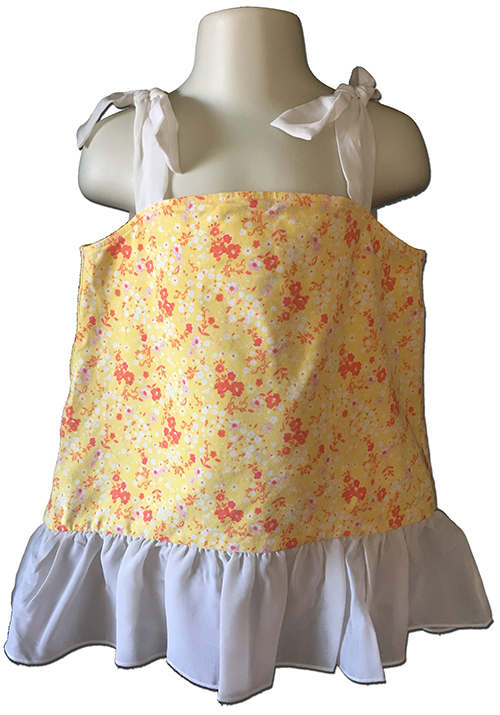 This beautiful hand crafted dress is from Ellie's Handmade, in a yellow vintage rose print cotton and featuring short sleeves and rear buttons. 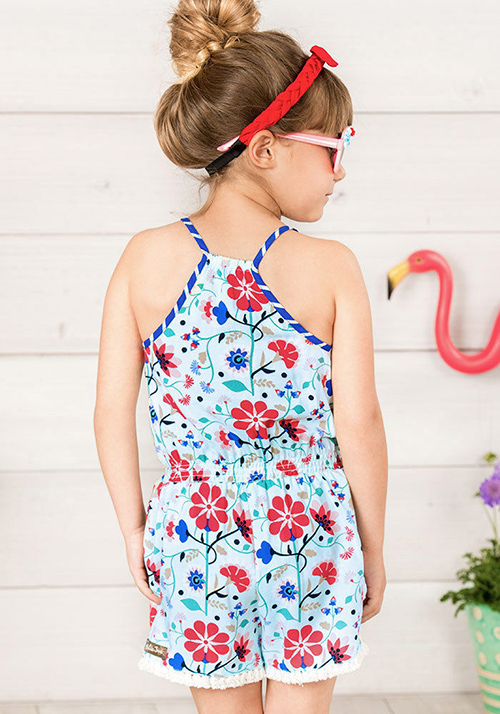 Size 6, which according to the Ellie's Handmade size chart is to fit chest size 24.5" (62cm), it's about 61cm around the chest under the arms and 62cm long from shoulder to hem, and in exceptional, could-pass-for-new condition. 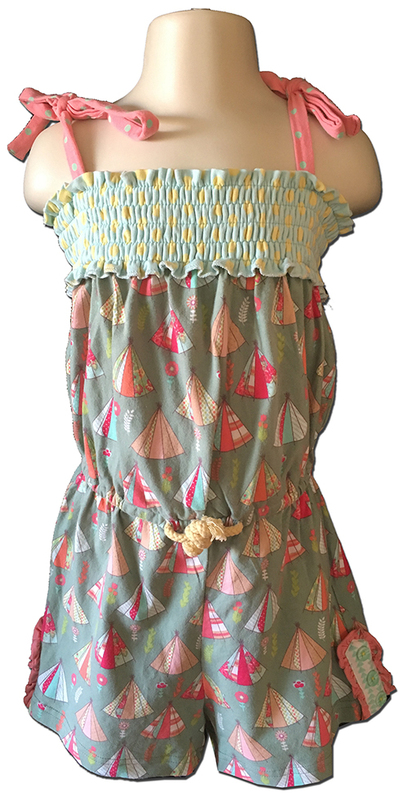 This beautiful hand crafted dress is from Ellie's Handmade, in an exquisite pale pink cotton with the sweetest mermaid and narwhal print including metallic gold accents. I love the crossover back with comfy elasticised panels. Size 6, which according to the Ellie's Handmade size chart is to fit chest size 24.5" (62cm), it's about 63cm around the chest under the arms and 63cm long from shoulder to hem, and in exceptional, barely used condition. 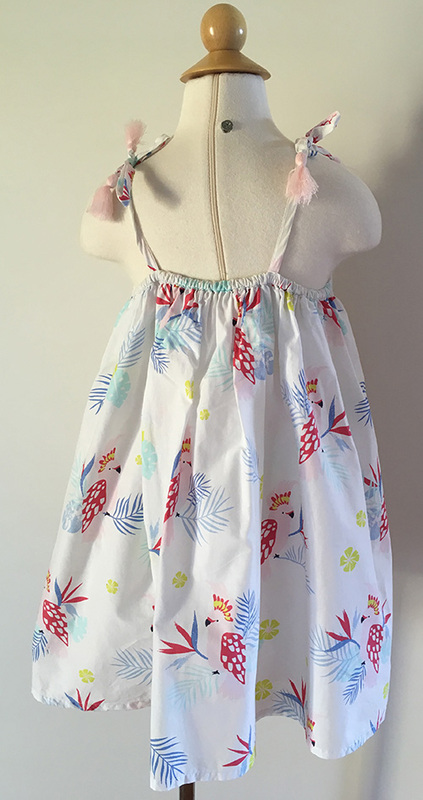 This beautiful hand crafted dress is from Ellie's Handmade, in an exquisite pink cotton with the sweetest Alice in Wonderland themed print and contrast white Alice collar. 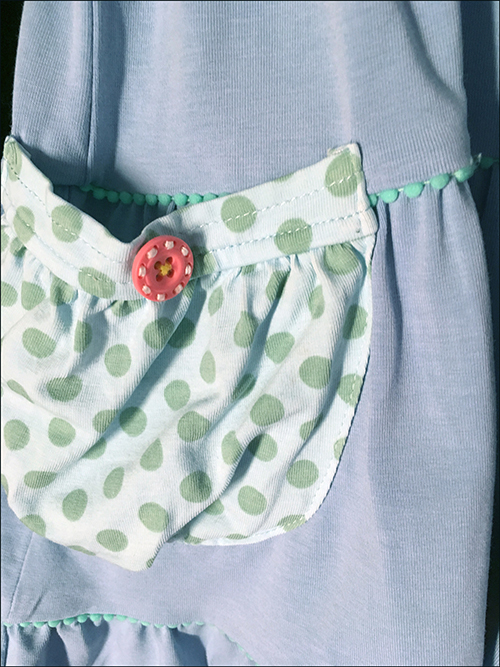 It fastens with rear buttons. Size 6, which according to the Ellie's Handmade size chart is to fit chest size 24.5" (62cm), it's about 64cm around the chest under the arms and 63cm long from shoulder to hem, and in exceptional, barely used condition with the only flaws being one tiny daint dot on the bodice which is covered by the collar. 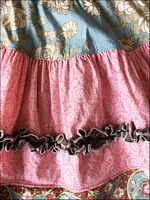 The Molly is my absolute favourite Matilda Jane skirt design as it just looks SO fantastic on - full and flouncy and great for twirling, and this one uses some of my favourite fabrics too, including the Red and Gold Toile from Robyn Pandolph's Chateaux Rococo collection. Any item from the Peace by Piece collection is now super-hard to come by. 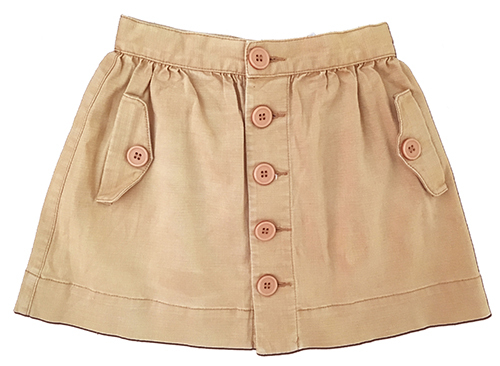 The elasticised waistband makes it both comfy to wear and very versatile size-wise. 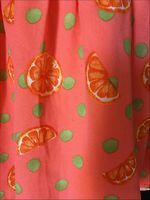 Size 6, it measures about 39cm long from waistband to hem. This has been gently used with only light wash fade and wear, but what you will notice compared to the stock photos is the lack of a trim! It was a Vintage ribbon and the first time everyone who bought from the same batch washed them they completely fell to pieces. I emailed MJ who rather unhelpfully told me to post it back (at my expense!) for a refund so I opted to keep them and just removed the trims and luckily you can't even tell where it used to be - such a shame as they made a big deal about sourcing the Vintage trim so I was really disappointed. 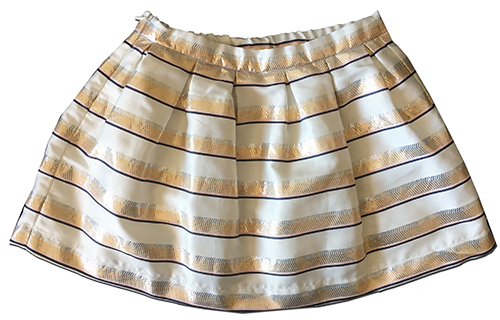 Still a thoroughly gorgeous skirt. 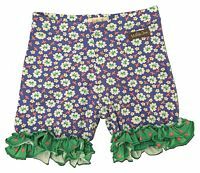 These are the beautiful Popover shorties from Matilda Jane's Happy and Free Collection, in a lovely blue floral 95% Cotton 5% Spandex, with cute green polkadot double ruffle trims on the legs. This was such a hard colour to capture and my photo makes them look a more purple than they actually are, so please refer to the stock photo which shows them more accurately. 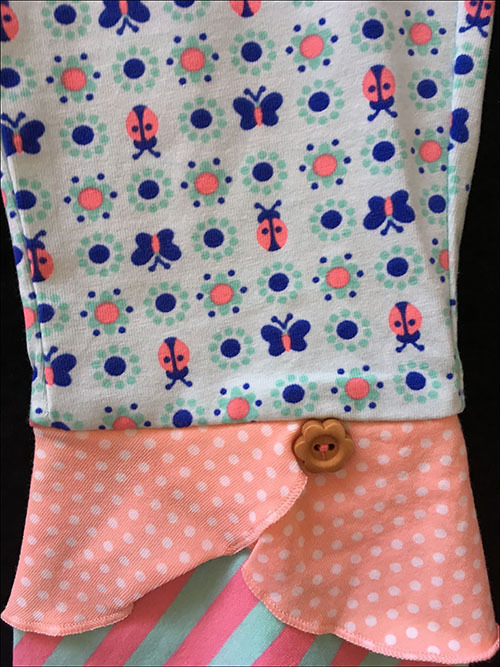 Size 6, they're about 26cm long on the outer legs and 12cm long on the leg inseam and are in excellent, gently used condition. This is the amazing Matilda Jane Ruby Ellie dress, released as part of the Serendipity collection. 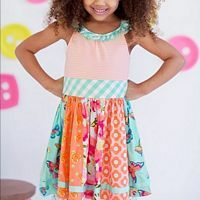 Brand new with tags attached, it features a myriad of stunning fabrics with a ruched back for a fabulous fit and the prettiest glitter trim. 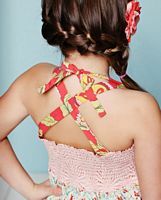 I love the way the shoulder straps can be tied in a variety of different ways. 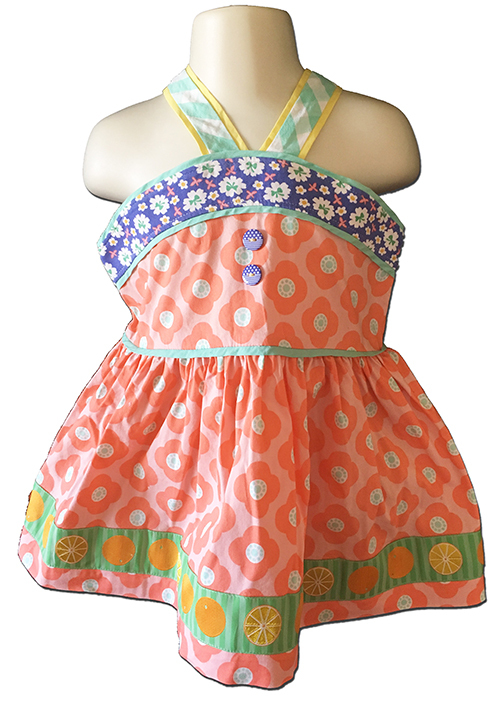 Size 6, it's about 51cm long along the side seam from underarm to hem with the overall length adjustable with the straps. 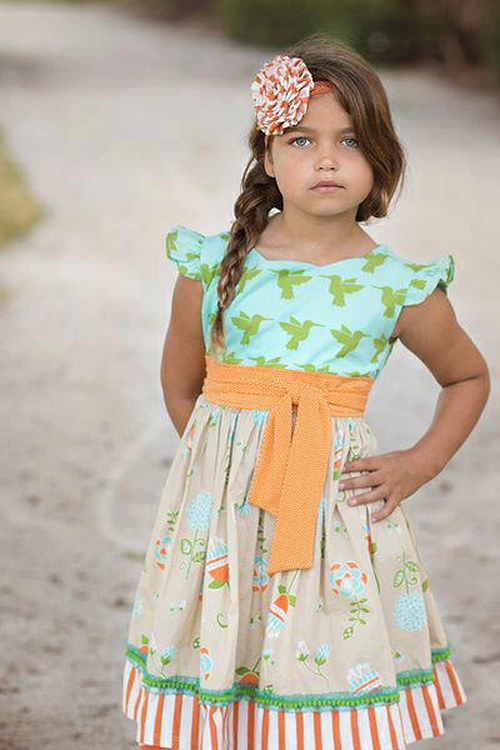 This is the beautiful Tangy Shasta top from Matilda Jane's Happy and Free collection, featuring an adorable aqua ladybird and butterfly print (the same used in the Patisserie Scrappy leggings listed separately while they last) bodice with polkadot waist sash ties and an orange print chiffon skirt lined in the same polkadot jersey used on the waist. 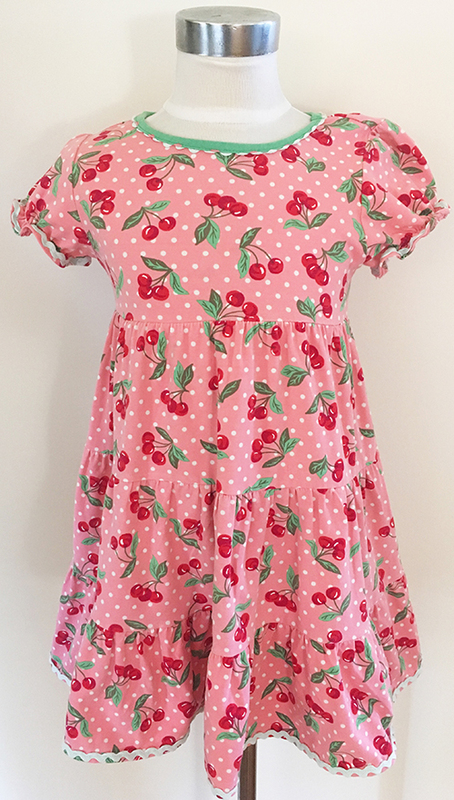 Size 6, it's about 60cm around the chest under the arms unstretched and 48cm long shoulder to hem, and is in excellent, gently used condition with just two tiny dots on the front skirt that would never be noticeable when worn. 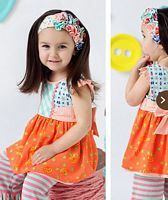 Also included is the beautiful matching Pizelle headband which is in excellent, gently used condition. 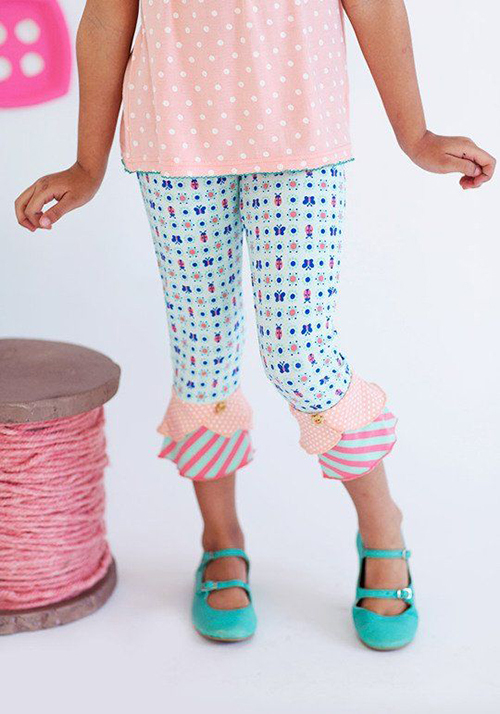 These are the adorable Patisserie Scrappy leggings, released as part of Matilda Jane's Happy and Free collection. 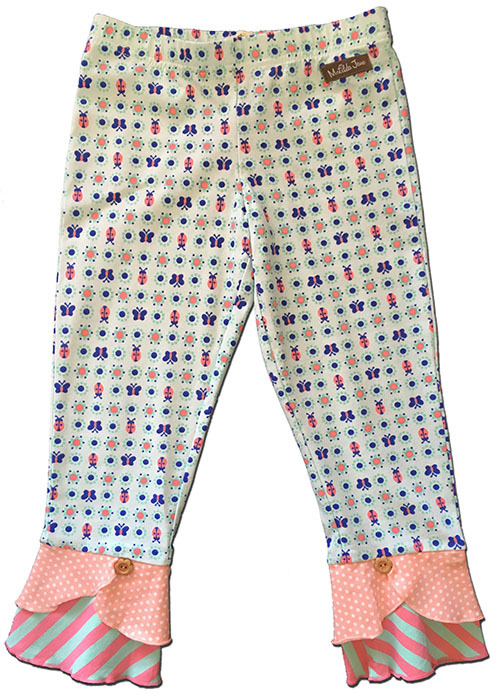 They're in an adorable aqua ladybird and butterfly print (the same used in the Tangy Shasta top listed separately while it lasts) 95% Cotton 5% Spandex jersey with fun flared and button accents at the ankles, and are a Size 6, measuring about 55cm long from waistband to ankle and 42cm on the leg inseam. These are brand new with tags attached. 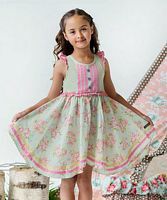 This is the beautiful Little Miss Alice dress, from Matilda Jane's Once Upon a Time collection. 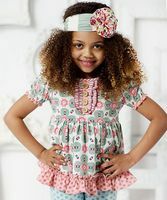 It's in a lovely dusky print floral stretch 95% Cotton 5% Spandex jersey with long sleeves and a full, tiered skirt. 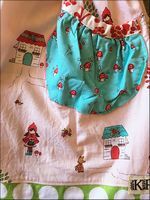 Size 6, it's about 60cm around the chest under the arms unstretched and 64cm long shoulder to hem, and in excellent, gently used condition. 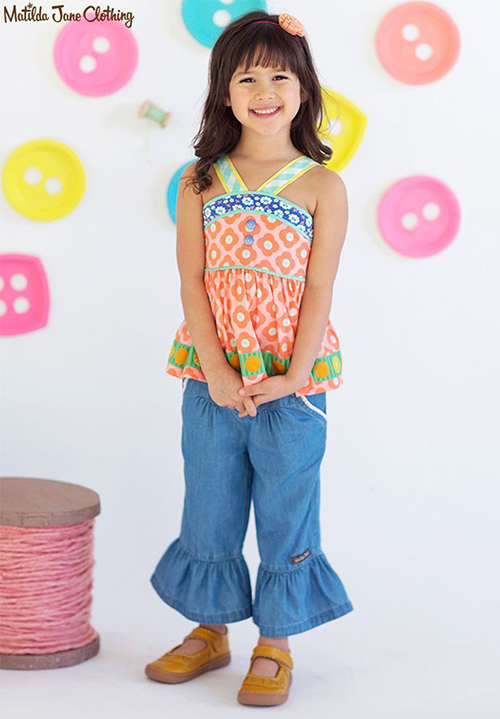 This is the gorgeous Meringue top from Matilda Jane's Happy and Free collection, in a brightly coloured crisp cotton blend with a shirred, elasticised rear bodice, adjustable-button cross-cross shoulder straps, and a sweet orange motif ribbon trim. 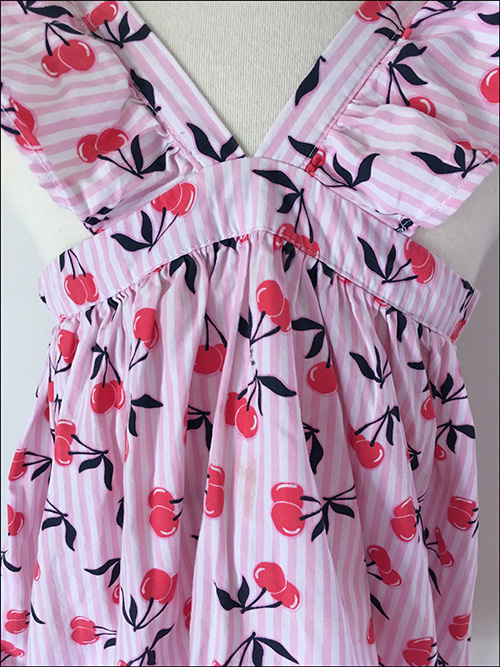 Size 6, it's about 58cm around the chest under the arms unstretched and 47cm long shoulder to hem (adjustable), and is in excellent, gently used condition. 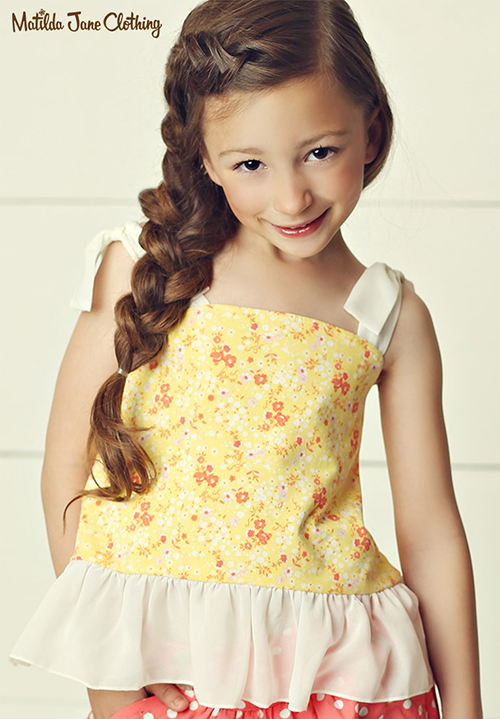 This is the gorgeous Flower Stand tank top from Matilda Jane's Hello Lovely collection, in a brightly yellow 95% Cotton 5% Spandex jersey with the most lovely ivory chiffon sleeves and skirt. 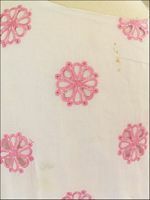 Size 6, it's about 60cm around the chest under the arms unstretched and 46cm long shoulder to hem, and appears to be new without tags. 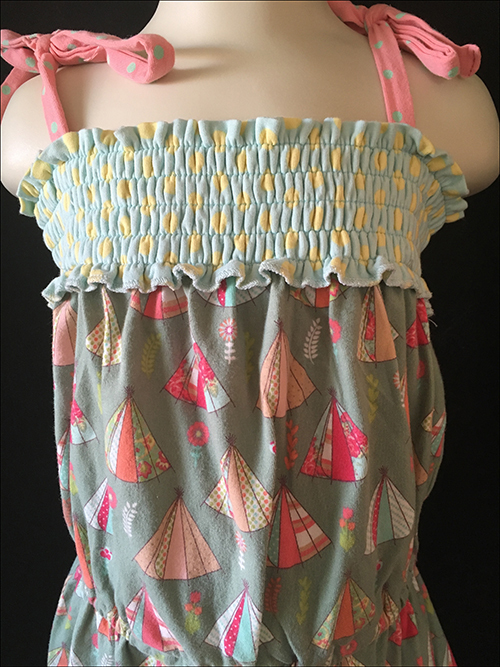 This is the amazing Gallant Tunic top from Matilda Jane's Once Upon a Time collection, in a soft and stretchy 95% Cotton 5% Spandex jersey with fabulous colours and the most beautiful triple tiered detailing to the back. 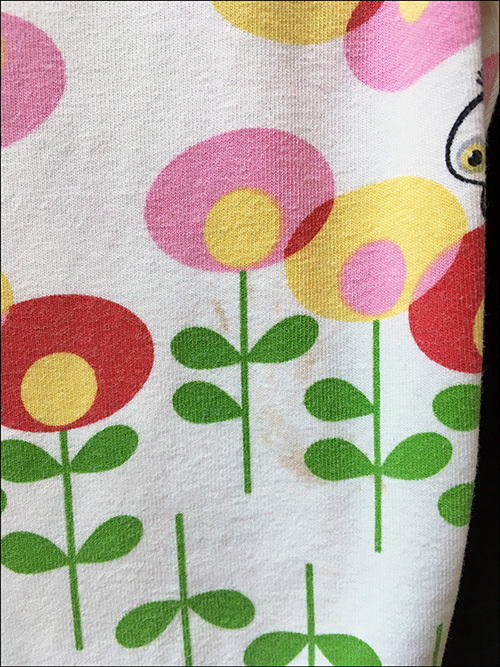 Size 6, it's about 60cm around the chest under the arms unstretched and 51cm long shoulder to hem, and appears to be new without tags. 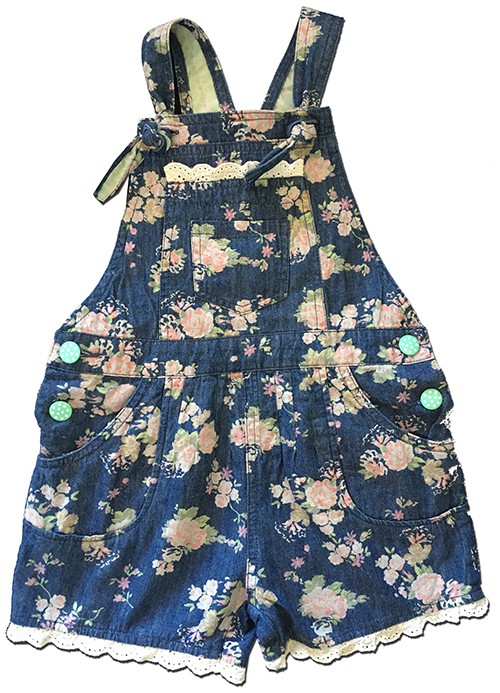 These adorable shortalls are called the Tug of War Romper, from Matilda Jane's The Adventure Begins collection. They're in a beautiful aqua (definitely closer in shade to my main photos than to my close-up or the stock pics which make it look more blue than it is) floral Rayon and feature an elasticised waist and back panel, cute fringe detailing and red buttons on the bodice - I have only just realised I didn't have them all buttoned for the photos but they are definitely all there! 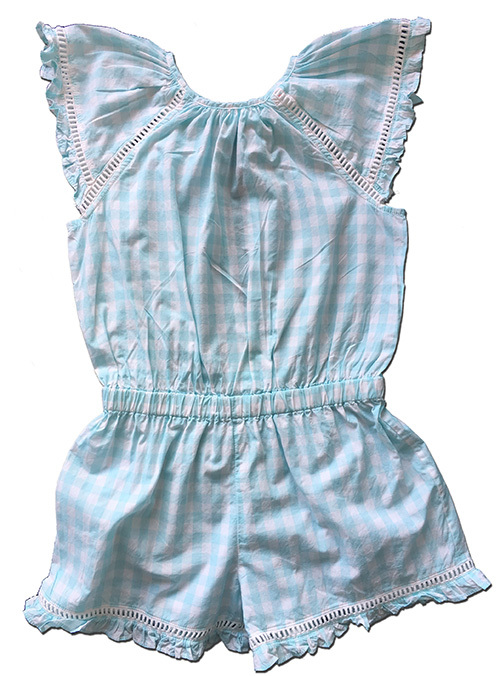 Size 6, this romper is about 62cm around the chest under the arms unstretched, and is in excellent used condition overall however does have some small marks on the front as shown that look like texta. 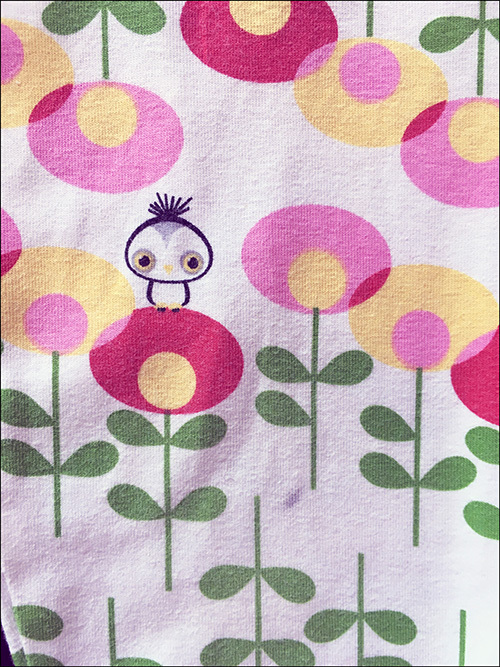 They blend in fairly well with the busy print but do need mentioning. 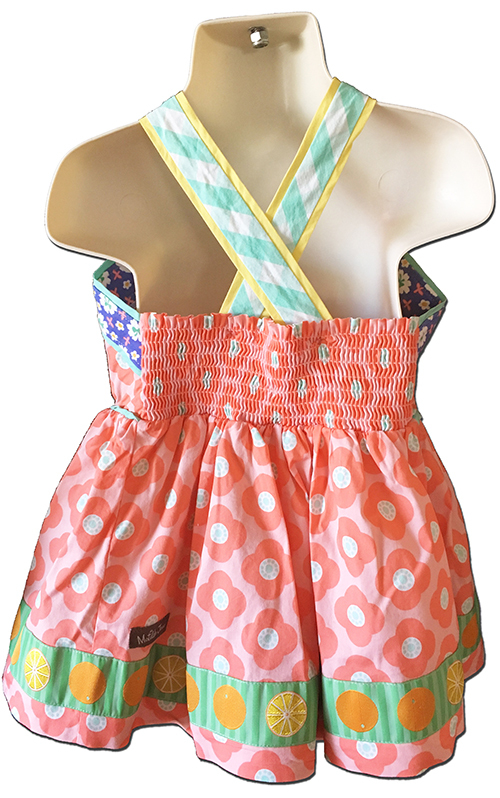 These adorable shortalls are called the Campfire Stories Romper, from Matilda Jane's Happy and Free collection. 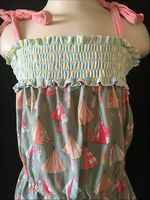 They're in a beautiful khaki 95% Cotton 5% Spandex jersey with the most fun tent print throughout, and feature an elasticised waist and bodice and adjustable shoestring tie shoulder straps. Size 6, it's in excellent, barely used condition. This is the gorgeous Cherry Pie dress from Matilda Jane's Happy and Free collection, in a soft, stretchy and comfortable 95% Cotton 5% Spandex with a triple tiered and beautifully full skirt. 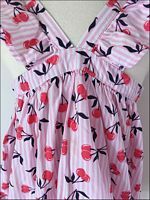 Size 6, it's about 64cm around the chest under the arms unstretched and 62cm long shoulder to hem, and in excellent, gently used condition. 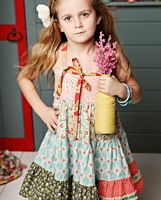 This is the gorgeous Lilies of the Valley Tank top, released as part of Matilda Jane's Good Hart collection. 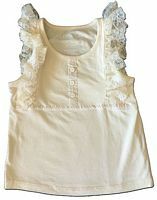 Made from a cream coloured cotton elastane that will ensure it goes with EVERYTHING, it features pretty lace and button detailing on the bodice, and is a Size 6, measuring (unstretched) about 60cm around the chest under the arms and 41cm long shoulder to hem. This is in excellent, gently used condition. 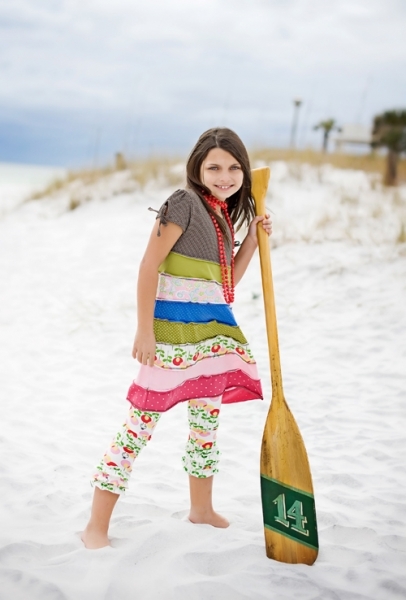 This is the lovely Life Is A Beach Peasant top from Matilda Jane's Happy and Free Collection, in a soft and stretchy 95% Cotton 5% Spandex blend apple print with an elasticised waistband and fun polkadot trims. 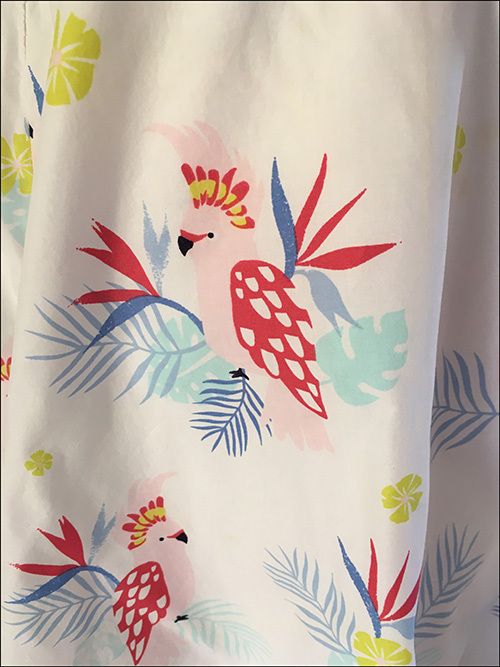 Size 6, it's about 60cm around the chest under the arms and 45cm long shoulder to hem, and is in flawless condition - could pass for new without tags. 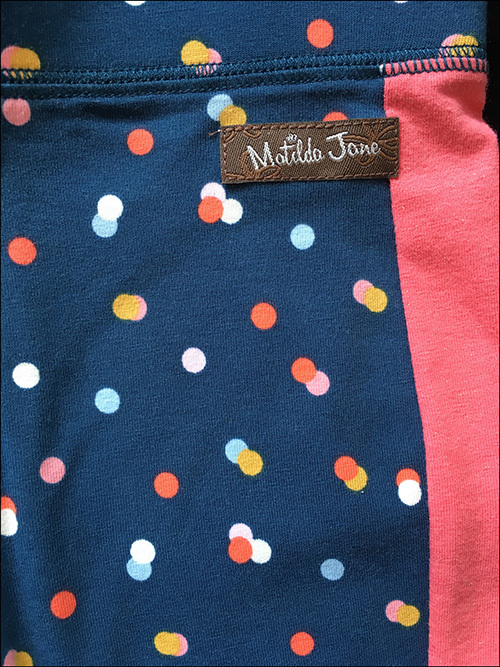 This is a piece of Matilda Jane history, the Pink Polka Dot Logo Tee from Hotline - one of their earliest collections. 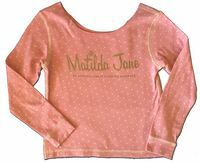 It's in a dusky pink polkadot 95% Cotton 5% Spandex blend, and features a raw-cut neckline, contrast stitching and metallic gold chest print. 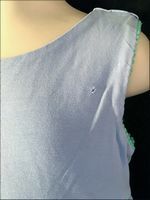 Size 6, this measures, unstretched, about 66cm around the chest under the arms and 41cm from shoulder to hem, and is in good used condition but starting to develop light pilling due to the spandex. A tonne of life left in this one though. 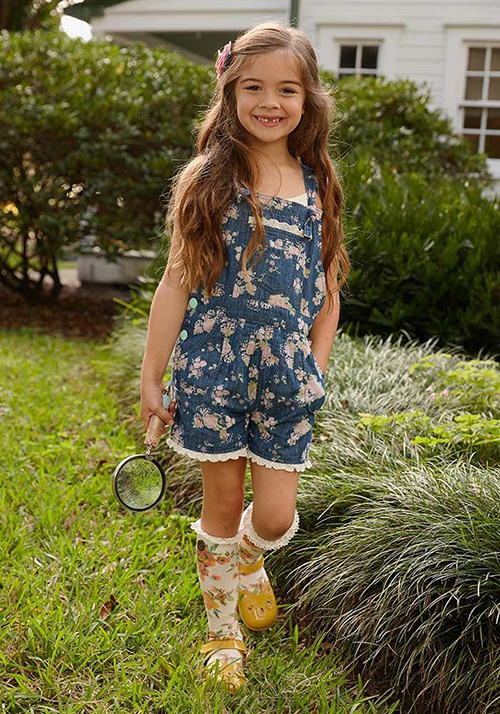 These adorable shortalls are called the Playground Romper, from Matilda Jane's The Adventure Begins collection. 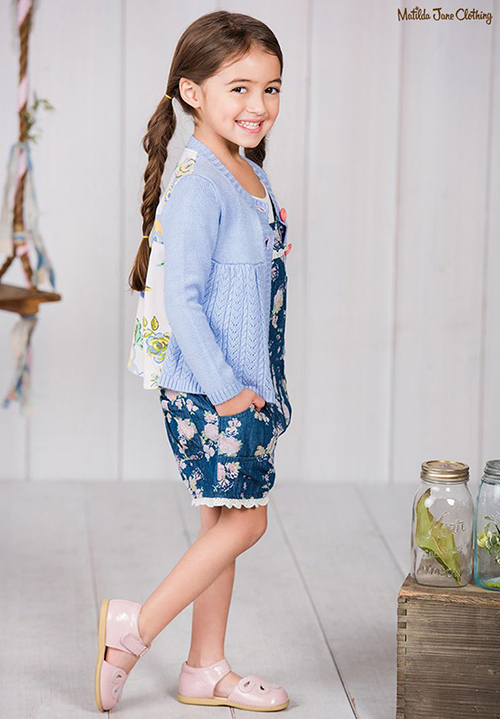 They're in a beautiful blue chambray floral Cotton and feature adjustable knot-tie shoulder straps with broderie anglais trims and fun aqua spot buttons at each side. 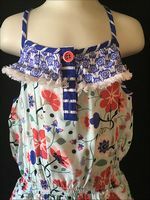 Size 6, this romper is about 64cm around the waistband and 56cm long (adjustable) shoulder to hem, and is in excellent, barely used condition. 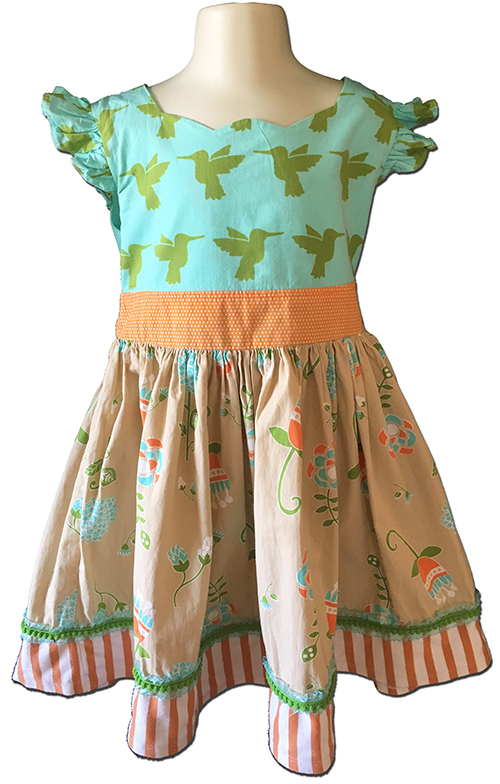 This is the stunning Hummingbird dress, released as part of Persnickety's Tea Party collection. 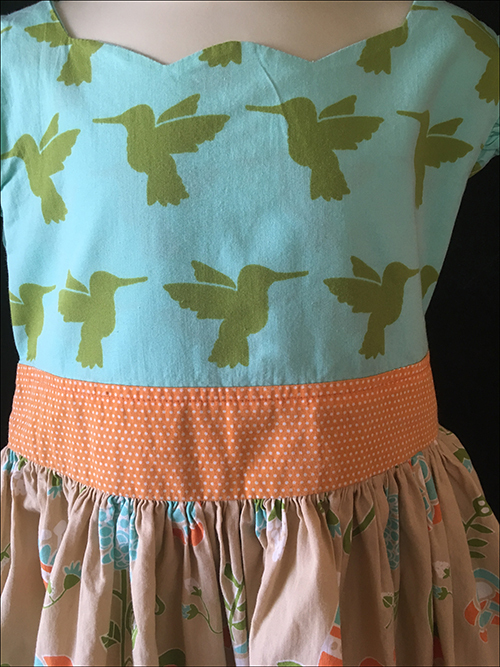 Made from a crisp 100% Cotton with a striped jersey hemline, it features flutter sleeves, waist sash ties, a rear zip and the beautiful Hummingbird print on the bodice. 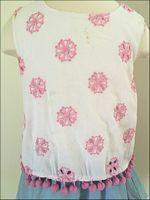 Size 6, it measures about 64cm around the chest under the arms and 63cm from the underarm to hem, and is in excellent, gently used condition. 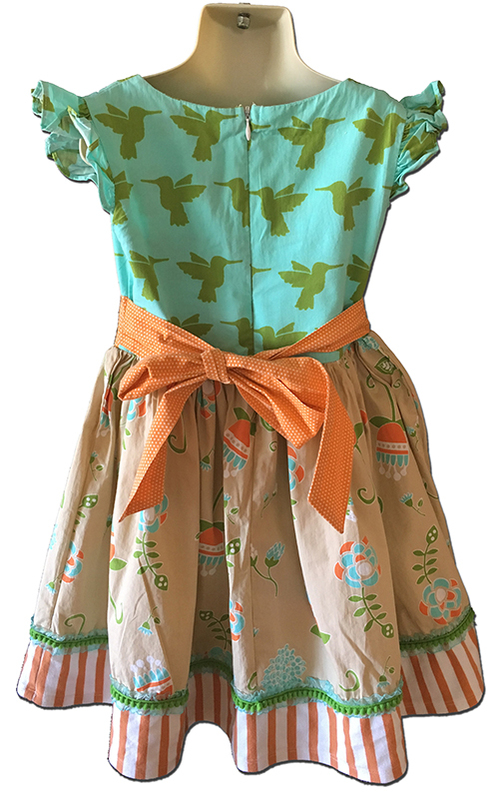 I just love this reversible Hummingbird tie skirt from Persnickety's Farmer's Market collection - the colours just POP! 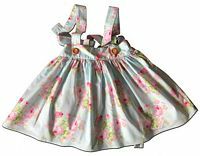 You could have her wear this several ways, with either the beige floral or the Aqua Hummingbird print as the front and then tie the reversible waist sashes at the front or back also. Endlessly versatile! Size 6, it's about 34cm long waistband to hem, and is in excellent used condition overall with the only real flaw to speak of being a 4cm section where the pom-pom hem (which seemed to vary from design to design as you can see from the stock photos) has unraveled as shown - you would probably be best to trim this excess off and then it wouldn't be terribly noticeable when worn. 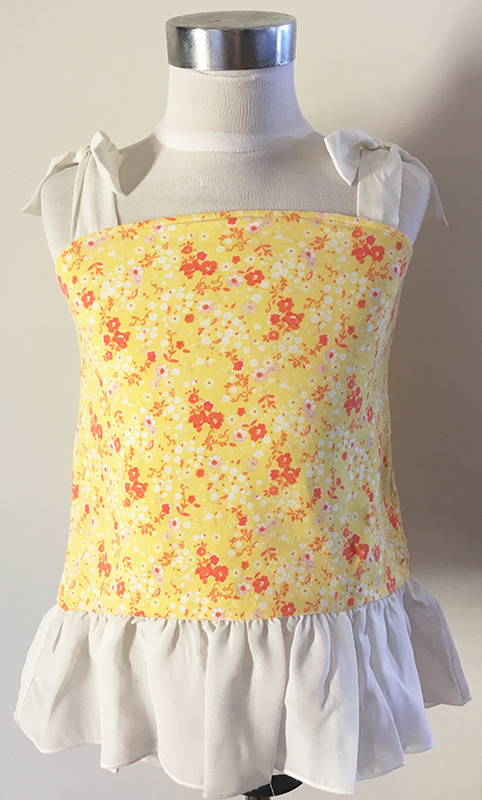 This lovely Lou Lou top from Persnickety's Garden Party collection is from a yellow striped stretch 46% Cotton, 46% Modal, 8% Spandex blend jersey, with a gorgeous floral yoke (the same fabric as used in the Mae shorties, listed separately in a Size 4 while they last) and ruffle accent. 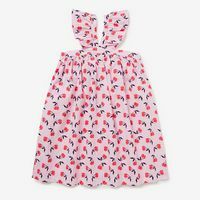 Tagged Size 6, but the Lou Lou design does generally run a little small so please check the measurements provided, which are about 68cm around the chest under the arms unstretched and 44cm long from shoulder to hem. It's in great used condition overall with minimal fade and just some mild pilling to the jersey. 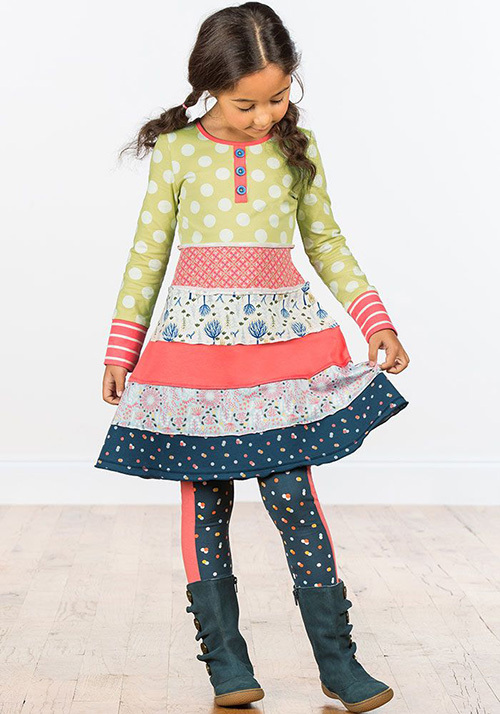 This is a great value set of three tops from Country Road Child, all in a Size 6. 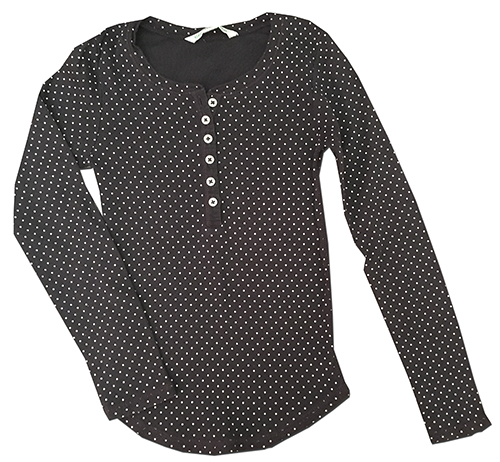 The first is a Henley style in a Charcoal 100% cotton with tiny polkadots throughout. 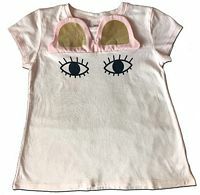 It measures about 54cm unstretched around the chest under the arms and 46cm long from shoulder to hem, and is in good, sturdy condition with just mild wash fade and wear. 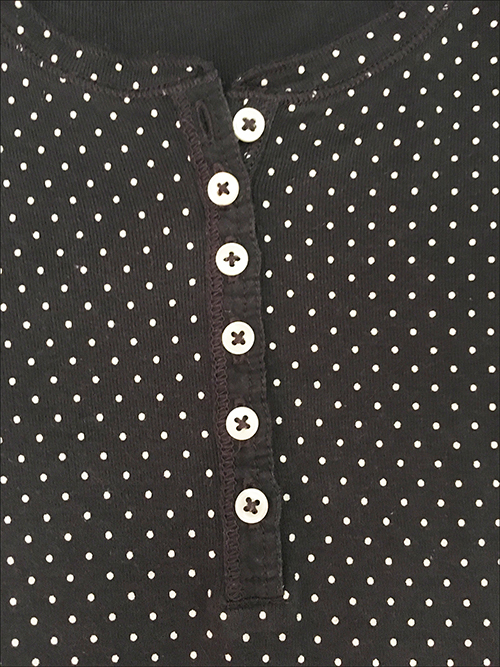 The second is another Henley style in a navy and white striped 100% cotton and contrast stitching. 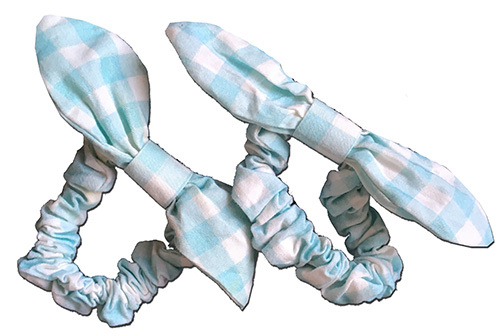 It measures about 54cm unstretched around the chest under the arms and 46cm long from shoulder to hem, and is in excellent used condition with just the lightest "fuzzing" to the wrists. 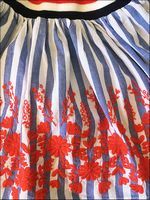 The third has navy pinstripes with a colourful pear chest print. 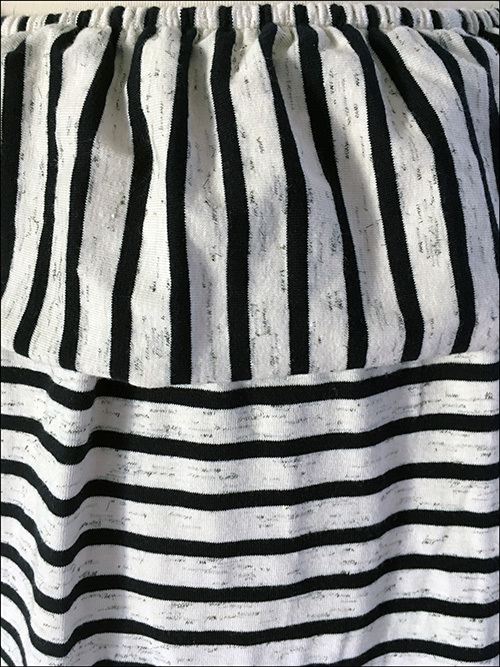 It measures about 56cm unstretched around the chest under the arms and 45cm long from shoulder to hem, and is in in good sturdy condition, however does have some cracking developing to the print. 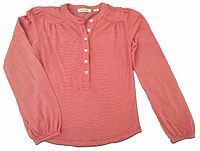 This fab Henley top from Country Road Child is in a soft and comfortable red striped jersey cotton with pearlised front buttons and gathered shoulders. Size 6, it's about 66cm around the chest under the arms and 45cm long from shoulder to hem, and is in excellent, gently used condition. 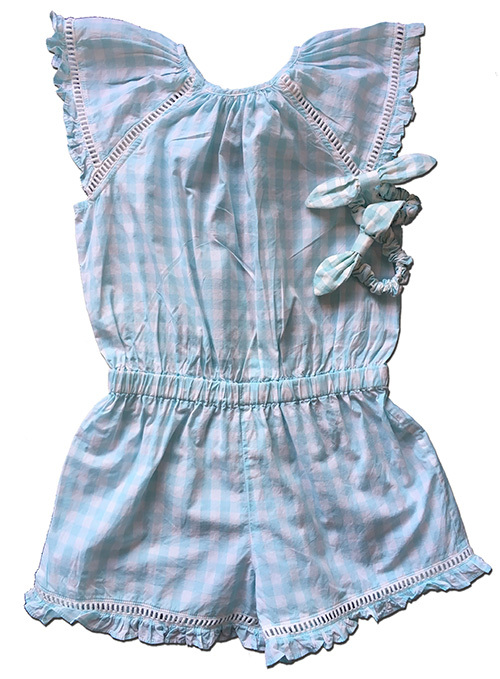 This is a really cute little two piece set from Seed Heritage in Size 6-7, probably best for at-home or playwear but still with tonnes of life left in it. 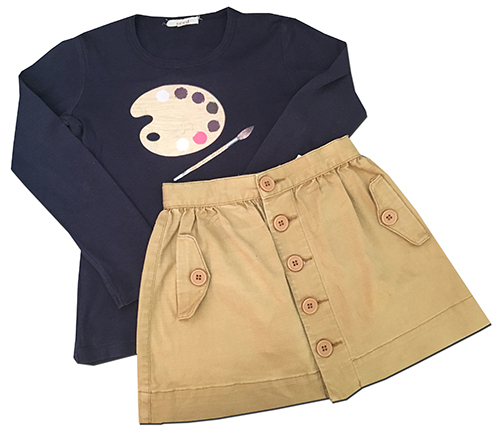 The top is in a navy blue cotton with a chest print of an artist's palette and paintbrush, and measures about 68cm around the chest under the arms and 45cm long from shoulder to hem, and is in good sturdy condition however does display significant cracking to the print as shown. 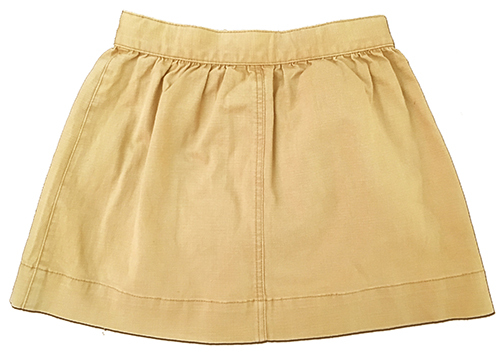 The tan skirt is in a heavyweight stretch 97% Cotton 3% Elastane blend and features adjustable inner-button tabs on the waistband, a button-down front and faux hip pockets. 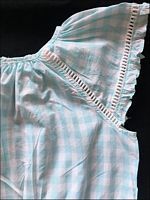 It's about 30cm long waistband to hem and in good condition, displaying just a little puckering to the fabric on the front left as shown, which wouldn't be terribly noticeable when worn but which needs mentioning. Still a really fun set on and priced at the tiniest fraction of retail. 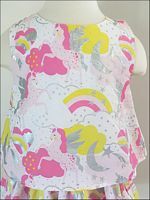 This lovely top from Studio 7 Dancewear is made from a black 90% Cotton, 10% Lycra blend, and is a Size Medium to fit Size 6-8 Child's, measuring about 26cm long shoulder to hem. This is in excellent used condition with very little washfade - I had to lighten my photo to show the detail. The previous owner's name is written on the inner care label. 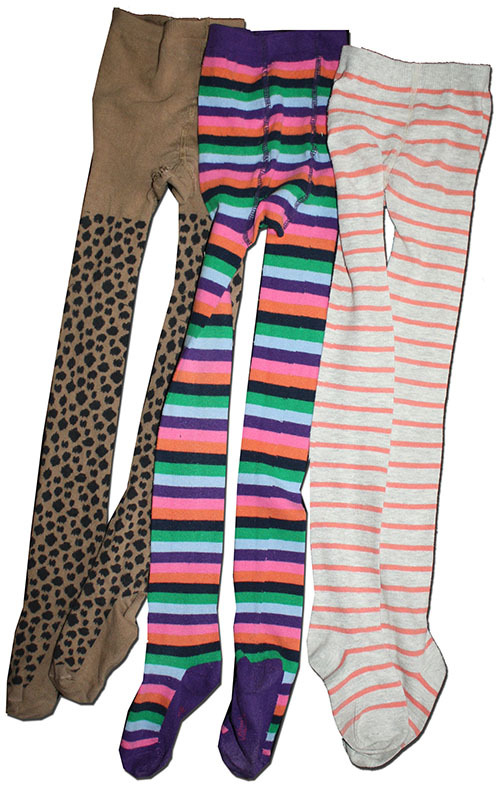 This is a great value lot of three pairs of tights for your Size 6-9 little girl. 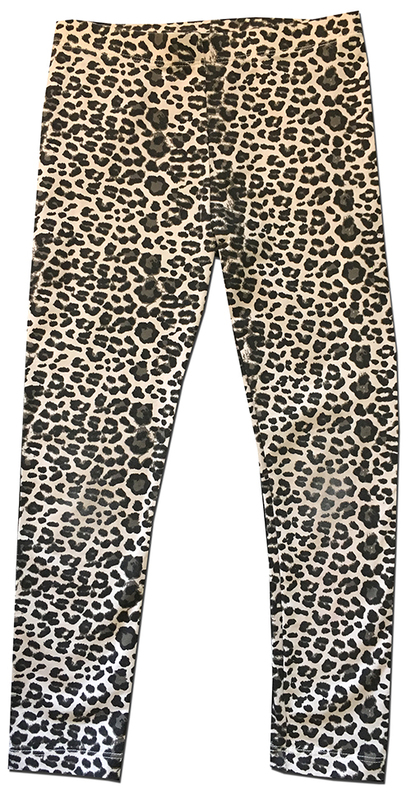 The first are a leopard-print pair from Witchery Kids, tagged Size 6-9, in camel and black. These are in good used condition with only mild wear and minimal pilling but have a hole to the crotch as shown. 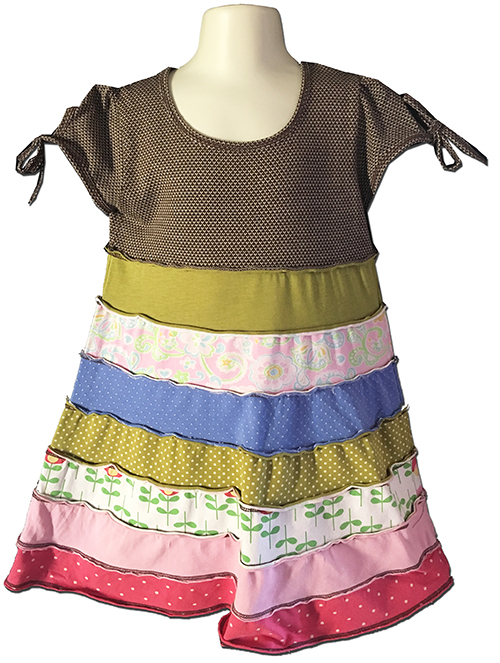 The next are from Columbine in a rainbow stripe, also tagged Size 6-9, and have some pilling throughout but no holes. 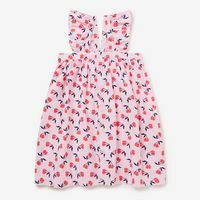 The final pair from Cotton On Kids (style name "Tilly") are tagged Size XL and are in a grey and coral stripe. These have pilling throughout as well as small holes to the crotch but still lots of life left in them yet. 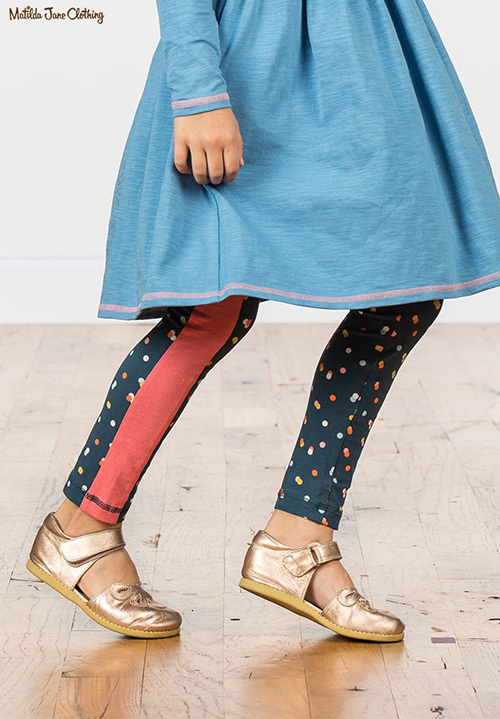 This gorgeous dress from Seed Heritage is in a charcoal marle grey fine knit cotton and features an intricately embroidered silver and gold sequined ice-skate motif. Size 6, it's about 78cm around the chest under the arms and 61cm long shoulder to hem, and is in excellent, gently used condition. This retailed for $70. 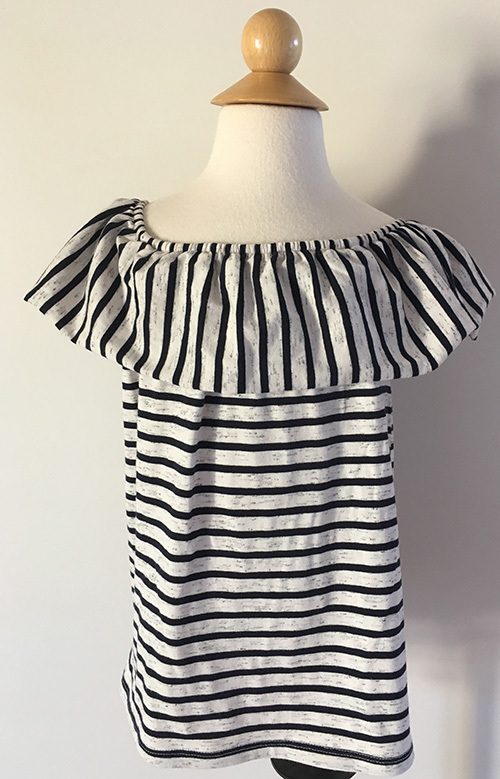 This gorgeous top from Seed Heritage is in a cream marle and navy striped 80% cotton, 15% polyester and 5% elastane jersey and features an elasticised neckline with large ruffle - could be worn off the shoulder or as shown. 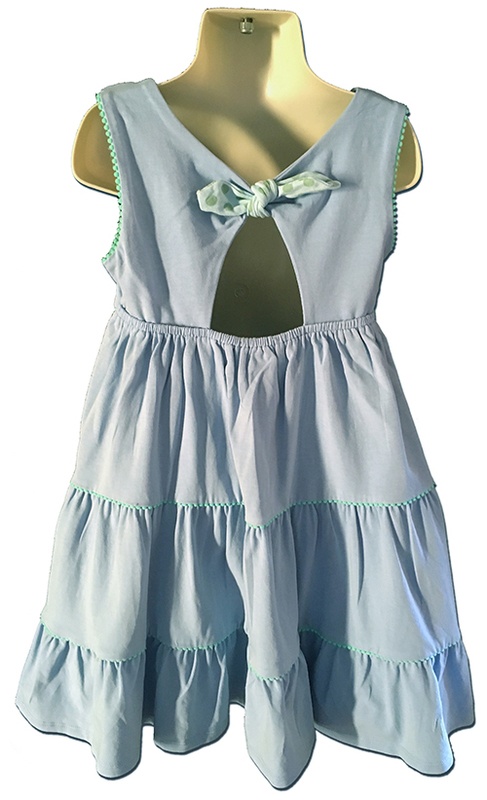 Size 6 (little girl's) 72cm around the chest under the arms and 47cm long shoulder to hem, and is brand new with tags attached. 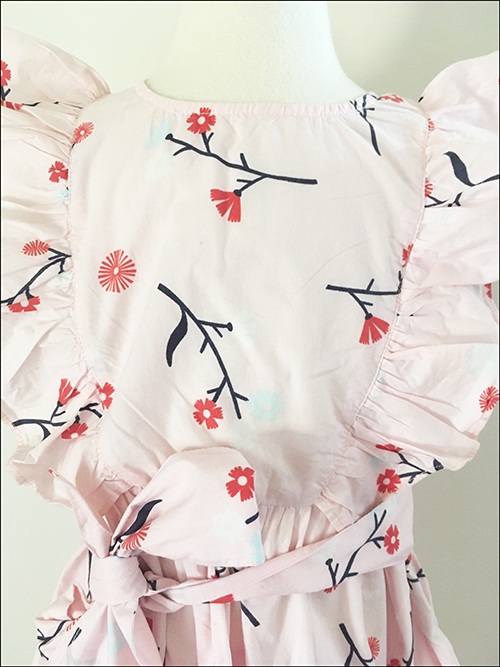 This beautiful playsuit from Seed Heritage is in a pale pink voile cotton with an all-over paisley print, elasticised waistband, rear buttons and tassel-end neckline ties. 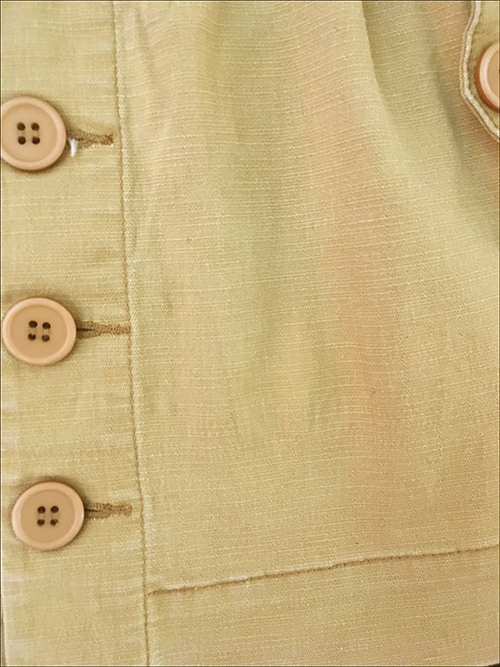 Size 6, it's about 76cm around the chest under the arms, 60cm long shoulder to hem and 6.5cm on the leg inseam. This is in excellent, gently used condition. 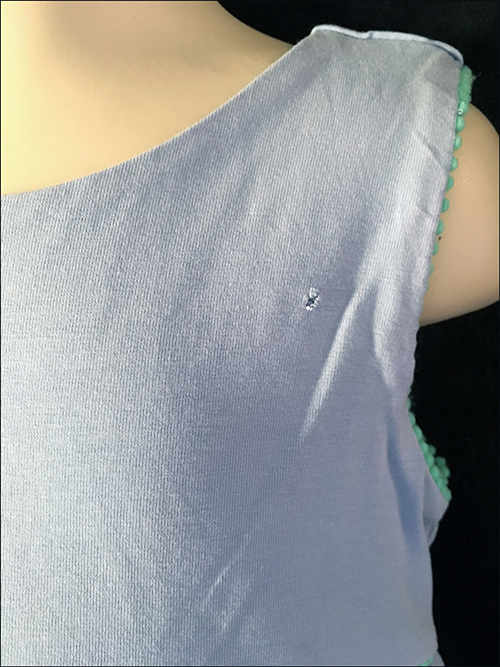 This gorgeous t-shirt from Seed Heritage is in a grey marle cotton and features an intricate sequined sunflower chest motif. 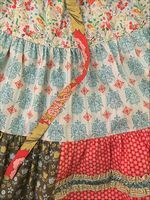 Size 6, it's about 62cm around the chest under the arms and 44cm long shoulder to hem, and is in excellent, gently used condition. 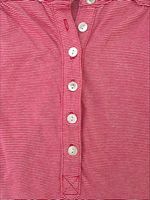 This gorgeous cardigan from Seed Heritage is in a fine knit 62% cotton 38% acrylic blend in block colours including fluoro pink trims and sleeves which my camera hasn't come close to capturing. 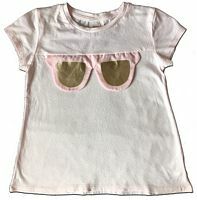 Size 6-7, it's about 72cm around the chest under the arms and 48cm long shoulder to hem, and is new with tags. 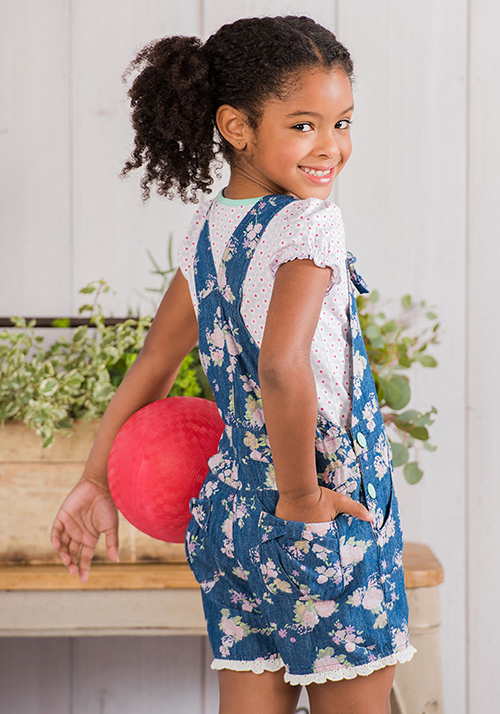 This lovely jumpsuit from Country Road is in a blue floral cotton with a comfy elasticised waistband, rear buttons and pretty flutter sleeves. 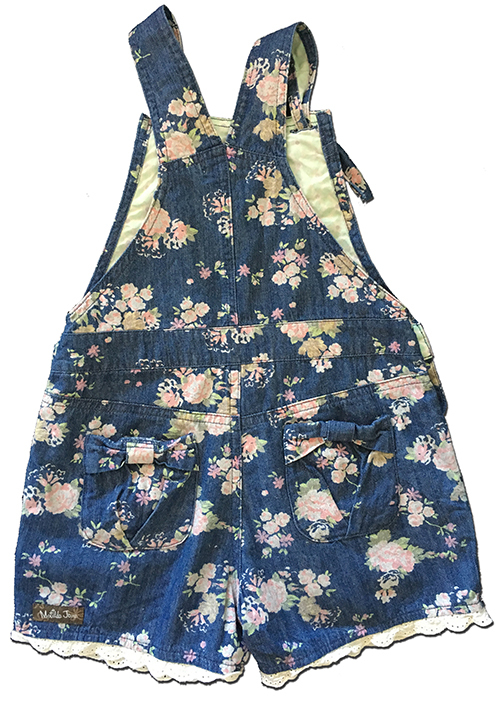 Size 6, it's about 68cm around the chest under the arms, 101cm long shoulder to hem and 46cm long on the leg inseam, and is in great used condition with just light, even wash fade.